The wind and rain kept us in Savannah for another day and the rain continued throughout Monday night and into the morning. Weatherbug showed the radar as light rain and it would continue through the morning but the winds were light. Quite a change from Sunday afternoon when Weatherbug flashed a Tornado Watch for eastern Georgia for a 7-hour period. We felt conflicted and torn between doing what everyone was doing and staying on the dock to wait another day and getting on the water and around that next bend because we were antsy to go. The longer we stayed, the easier it was to stay and the comfort zone was getting narrower. 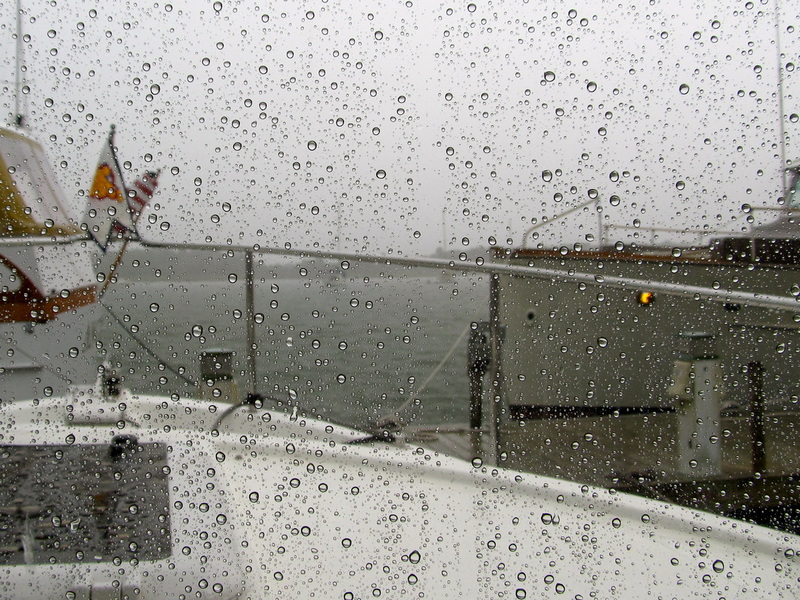 Boating in the rain, the wind and the cold is the accepted normal in Puget Sound if boating is done year round. Remembering that, Andiamo’s lines were cast off in the mid-morning. This would be a 54-mile day to Beaufort, South Carolina and at least third of the trip would be the expansive marsh and delta of the Savannah River and its tributaries, the Wilmington River, past Burnt Pot Island, through the eastern edge of Savannah urban area that was flush with boat yards and marinas until it abruptly ended, and past Elba Island and the north and south channels of the Savannah River. Then, Andiamo was in South Carolina where the river channel was winding and twisting with no channel markers. The trick is to keep the tug in the center of the channel without cutting any bends or taking any shortcuts as the shoals would be there. The tactic is to keep sweeping the vision from left to right and back again, assessing the distance on each side of the tug, and not fixating the vision on one place that was ahead. Fixating on one place is the useful tool of “target acquisition,” that is, what you look at is where you will go, instinctively and without conscious adjustment; great for docking, but bad for river bends. 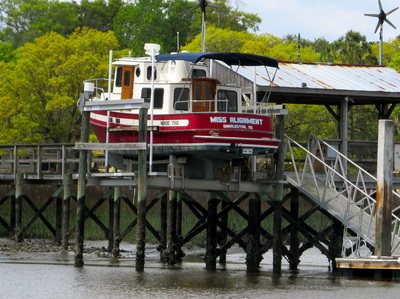 A quarter of the trip was around Daufuskie Island where a sub-culture of Black Americans evolved, cut off from the mainland, and whose children feared the water, rarely learning how to swim. One of the causes of drowning was the big boats of snowbirds moving between Florida and the northeast and whose wakes would swamp the small fishing boats. 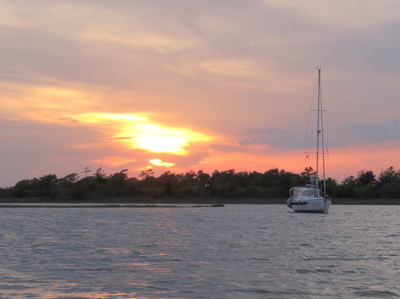 Leaving the Cooper River and entering Calibogue Sound that encompasses much of Hilton Head Island’s west side, Andiamo was powered up as the wind had increased and with it, the chop. 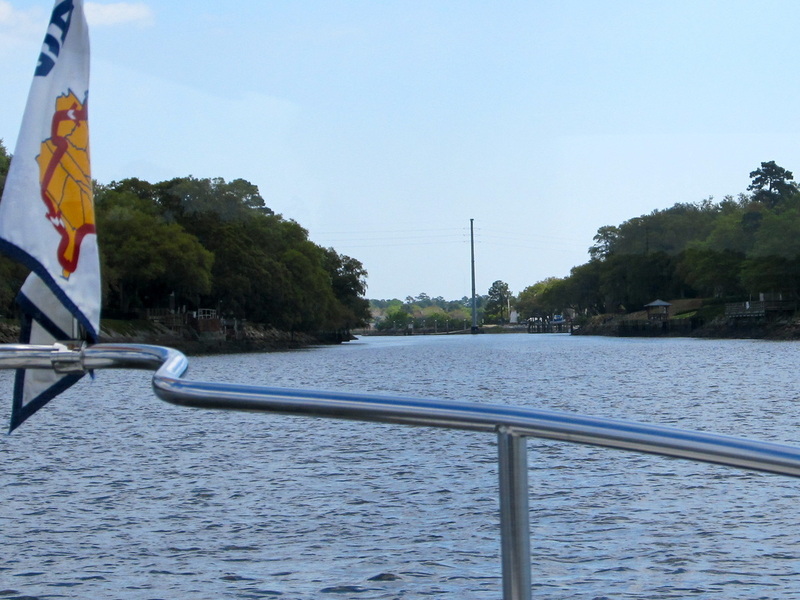 At the highway bridge that connects the mainland to Hilton Head Island, we turned to starboard, still following the ICW, and followed the passage to Hilton Head RV and Marina for their great fuel price. The current was racing with us and even in neutral, Andiamo was still going 3 MPH. 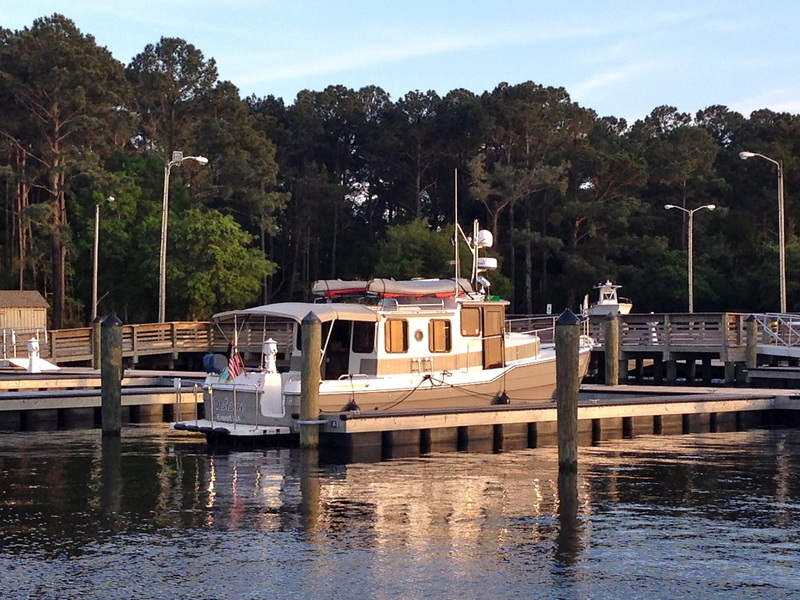 Docking was interesting but the stern line got cleated and from that pivot point, the rest was all easy. Andiamo had gone 241 miles since Jacksonville, used 2.0 gallons per hour and averaged 3.73 miles per gallon. 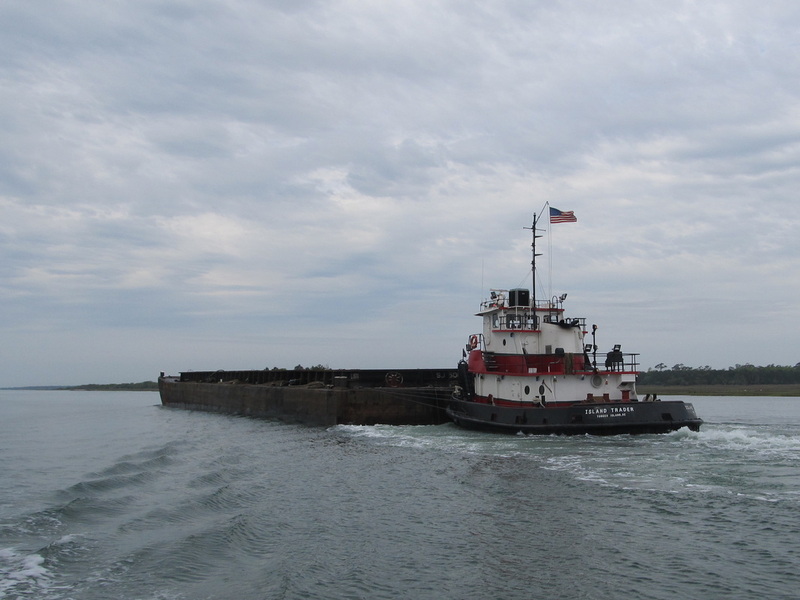 By the end of this day, the tug had taken us nearly 1,300 miles in 9 weeks. 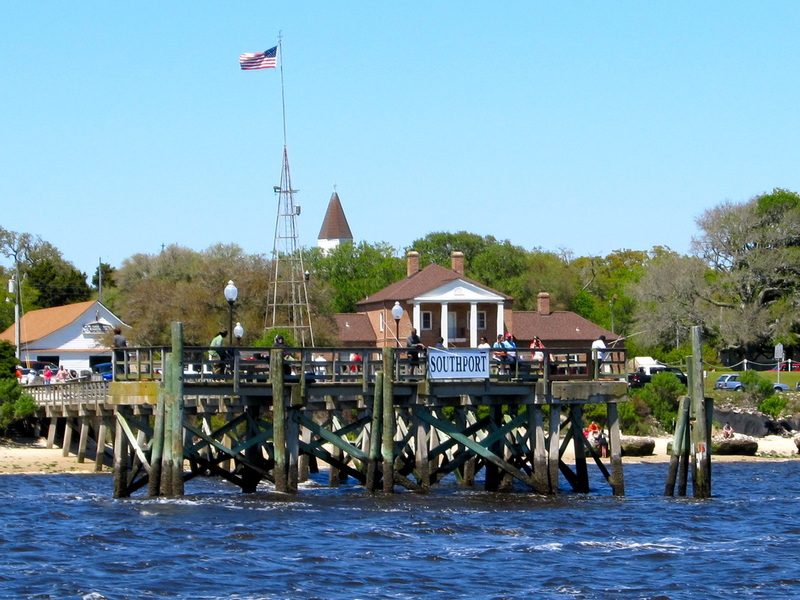 After Hilton Head Island, we crossed the wide Port Royal Sound, skirting the tip of Parris Island, turning to port and heading up the Beaufort River. 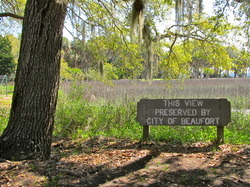 There are two Beauforts in the Carolinas, one in South Carolina that is pronounced BYOO-fert, the other in North Carolina that is pronounced BOH-fert. The Marine Corps is a dominant presence in this part of South Carolina with the Parris Island Marine Corps Recruit Depot and the Beaufort Marine Corps Air Station. As we traveled the length of Parris Island, we did not see any of the marines that go through the 13-week basic training. 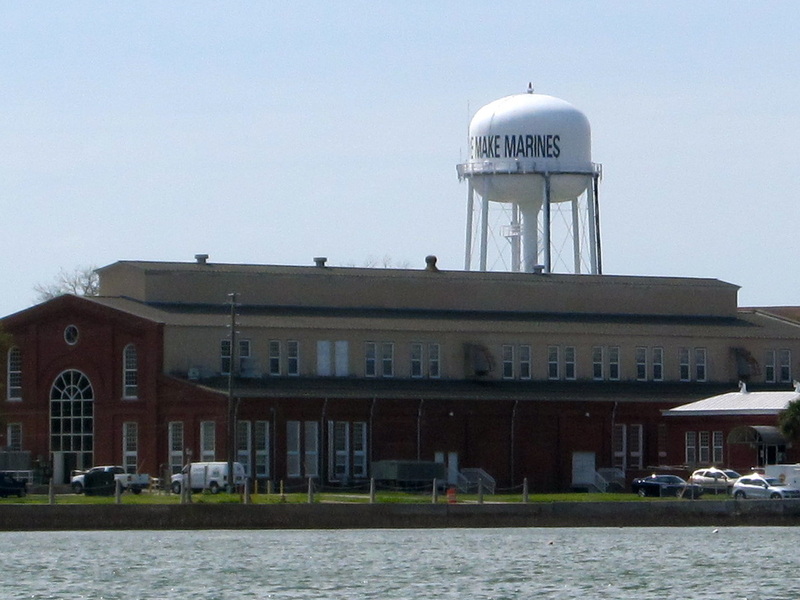 Parris Island has been training marines since World War I. The take-a-way lesson was the ramifications of reducing the training at the beginning of World War II to accommodate the huge numbers. Marines were not ready for combat and the Marine Corps went back to the tried and true program. The fact that the recruit training is done in a place that was abandoned by early French colonists who had fled the inquisition because of the island’s living conditions and returned to Europe and was inhabited by freed and escaped slaves during the civil war was not lost on us. Laurie had chosen the Lady’s Island Marina for our stay, passing up the Port Royal Landing and the Beaufort’s downtown marina because of the reviews, the feel, and the lack of current. 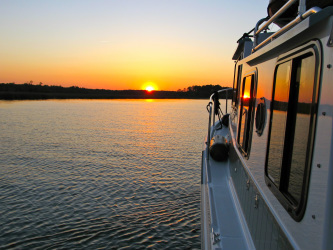 Plus, the daily moorage rate was the best and the live aboards that surrounded us were open and friendly. 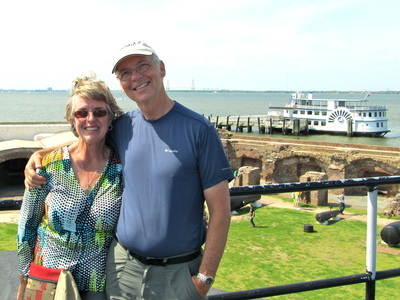 There were Looper boats and we re-united with Alan and Kathy whom we met at Jacksonville and later at Jekyll Island. The next day, the bikes were assembled after breakfast for the 1.5-mile ride into Beaufort where we spent most of the day in this town of 12,000. 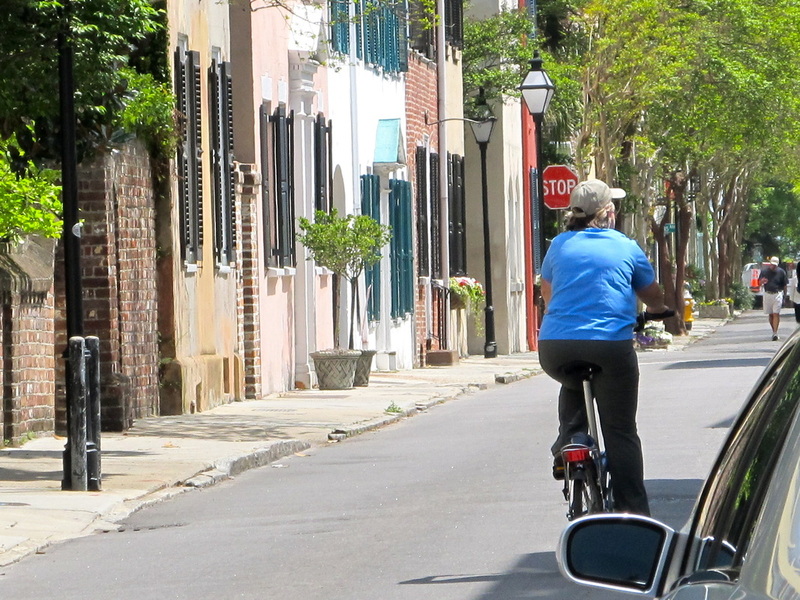 The historic district is compact and easily done on bikes because it is flat. 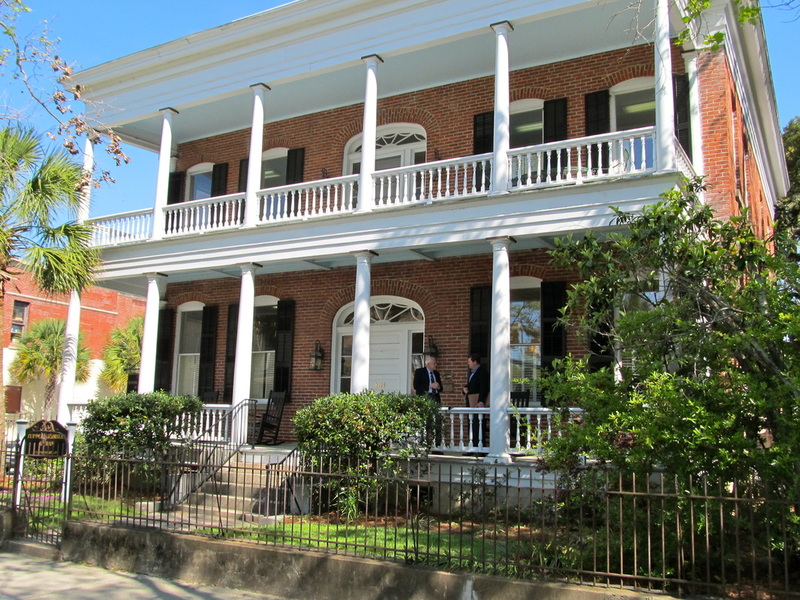 The homes survived the civil war because the Union Army operated their southern headquarters in Beaufort. We cycled and stopped, enjoyed a light lunch, walked the city waterfront and enjoyed the four blocks of shops before heading back in the mid-afternoon. In nearly 400 years of history, Beaufort is an example of adaptation. Claimed by the Spanish, French and Britain, site of various slaughters, occupied by the British during the Revolutionary War, and the Union Army during the civil war, the economy blossomed when cotton was introduced until the boll weevil ended that era and when the huge (if not a hurricane) storm of 1893 literally swept these sea islands clean of people, agriculture, and industry, Beaufort had to re-invent itself. 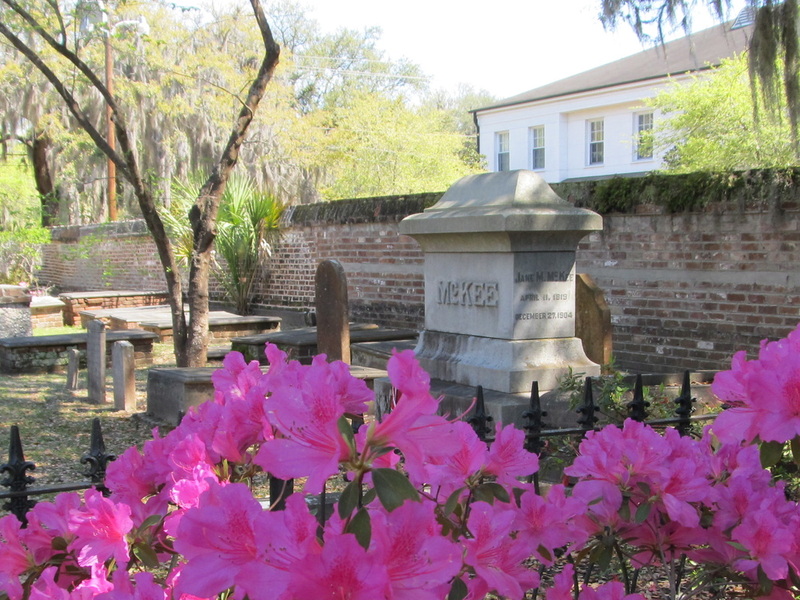 Laurie spent the remainder of the afternoon researching Charleston while I did small repairs and projects. 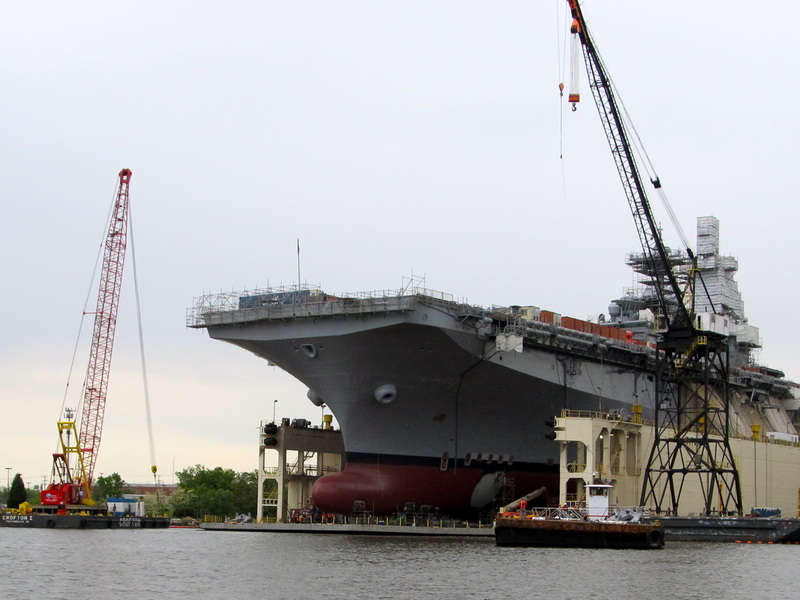 The heavy rain in Savannah had found its way into the mid-cabin berth requiring drying out and sealing the various penetrations of the cabin’s walls. Beaufort to Charleston is about 70 miles by car and a 90-minute ride. By boat, it is 70 miles of creeks, rivers, and cuts and though it can be done in a day, Andiamo did it in two and we were entertained with interesting names like the Coosaw River, Ashepoo River, Edisto River, Jehaossee Island, and Wadmalaw Island. The currents were a mess, sometimes Andiamo was going with God and then suddenly it was fight. The direction of currents probably only made sense if you could zoom out to see the overall picture of what rivers into fed what. The ICW weaves it way around “Sea Islands,” which in other states are called barrier islands. 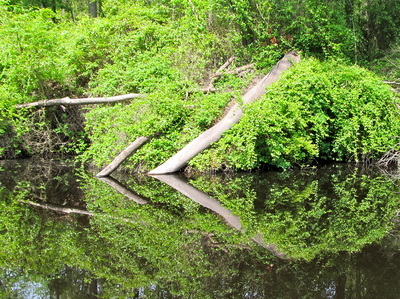 The rivers and creeks are occasionally connected by man-made intervention, called “cuts” that are actually long and wide ditches. Though the ICW was proposed in the early 1800’s and received some development in the later part of that century, the major work was done in the early 1900’s. 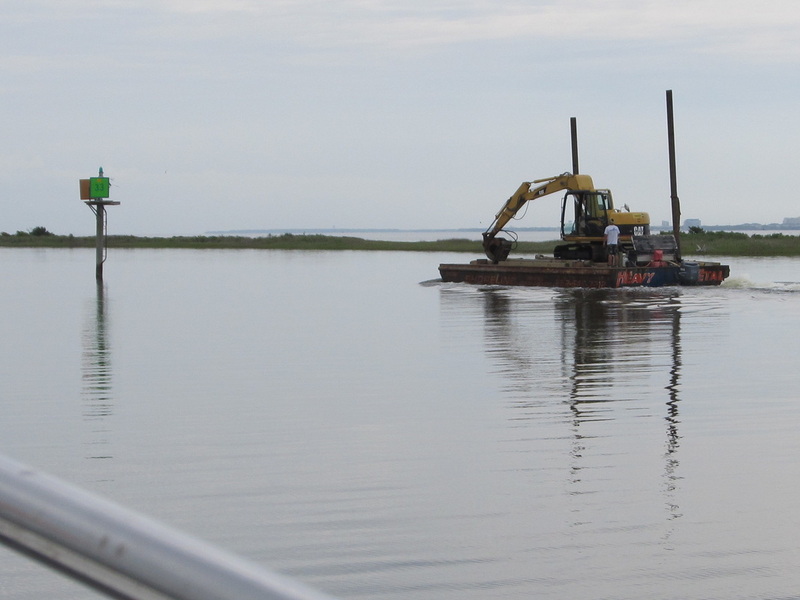 The cuts that Andiamo went through were probably done then, the maintenance and dredging has happened intermittently since the late 20th century. 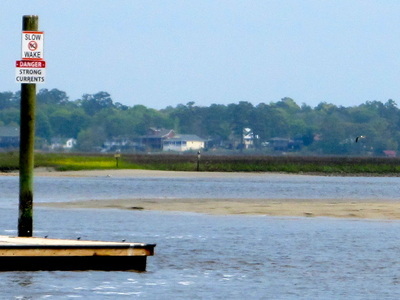 The Ashepoo-Coosaw Cutoff was an example of being very narrow and with water only 3 to 6 feet deep at low tide. Clearly, the bigger boats need to use a rising tide to get through. 41 miles after leaving Beaufort, Andiamo was anchored at Tom Creek Point, a creek in the marshland that about a mile off of the ICW, in 13 feet of water and with a pleasant 10-knot breeze from the south that kept the bugs at bay. We read in the cockpit, and sipped red wine until the sun went down. The evening was still and quiet. Anchoring is an act of faith, that in the dark of night with changing currents or wind, the heavy thing at the end of a chain will hold securely and especially during sleep while water slaps the hull and the wind rattles the rigging. In that regard, faith is like integrity or loyalty, either you have it or you don’t. Faith in Andiamo’s anchor system comes from experience and repeated good experiences. Also, as a practice, the anchor is put down in the afternoon and monitored for three hours before night falls. If the anchor holds for three hours, it will hold for 30 hours. The next day, the sunrise over the marshland was delightful and the bugs were back with the stillness, the clear skies, and the mirror flat water. Later, fisherman were seen with long sleeves, long pants, and hats with nets over their face and next. 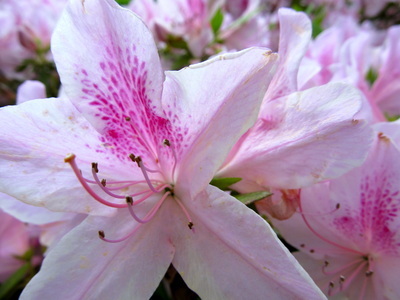 Local or traveler, the gnats and mosquitoes do not discriminate. 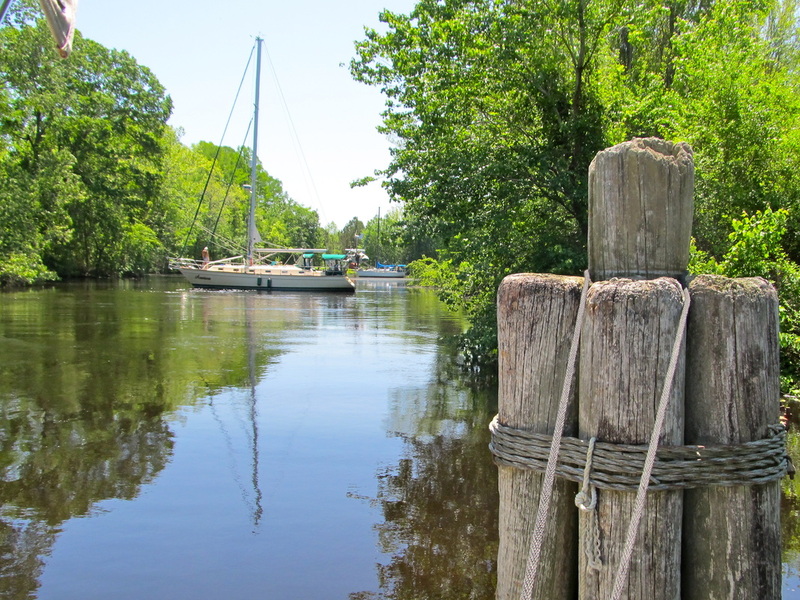 For the first 14 miles, Andiamo fought the heavy current on the Edisto River. Then, past Church Flats (“Go to church on the flooding tide and return on the ebbing tide,” the local saying goes) and Johns Island, the current switched directions and we enjoyed a smooth and economical ride all the way to Charleston. Elliot Cut is a connecting ditch that is narrow, deep and lined with nice homes, much like the Mountlake Cut that connects Seattle’s Lake Union to Lake Washington. Here the current can be quite swift and boats need to plan for it. Andiamo was only going a few hundred RPM’s above idle and the tug was still going 8 MPH. 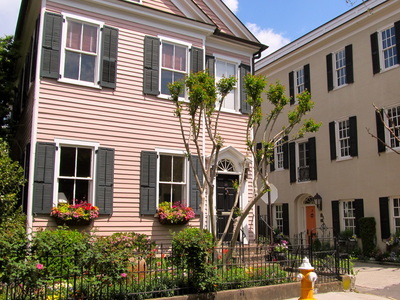 Historic downtown Charleston occupies a peninsula, shaped like a thumb, that has rivers on each side of it, and is tucked back from the opening to the Atlantic Ocean. 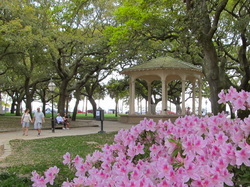 The urban area of over 150,000 has surrounded the bay and to the ocean. 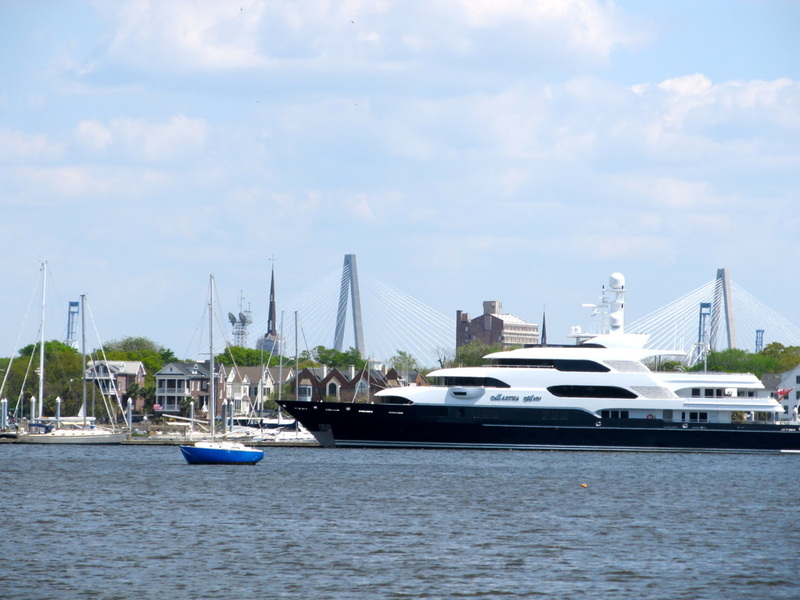 The destination in Charleston was the City Marina and we were assigned to a 30 foot gap between two mega-yachts on the inside of the marina’s “Mega Dock” which is 1,500 feet long, and 20 feet wide. Envisioning a parallel parking job between two ½ million dollar yachts, against the current and a brisk was breeze blowing Andiamo away from the dock was a sobering thought. Going slow, with the right use of rudder and throttle, adding a dash of thruster and Laurie’s good throw of the stern line to the dockhands made it all successful. 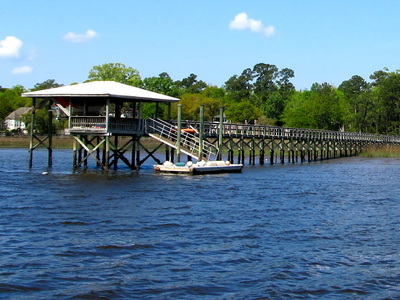 This dock is so long that the employees use golf carts for all of their business. Since the engine had charged the batteries and heated the water in its 4 hour run and the solar panel would easily keep up with the refrigerator’s use, we opted for not getting power for the first and maybe the second nights because between the daily power charge and the need to rent a 50 to 30 amp adapter, a nice lunch could be bought. 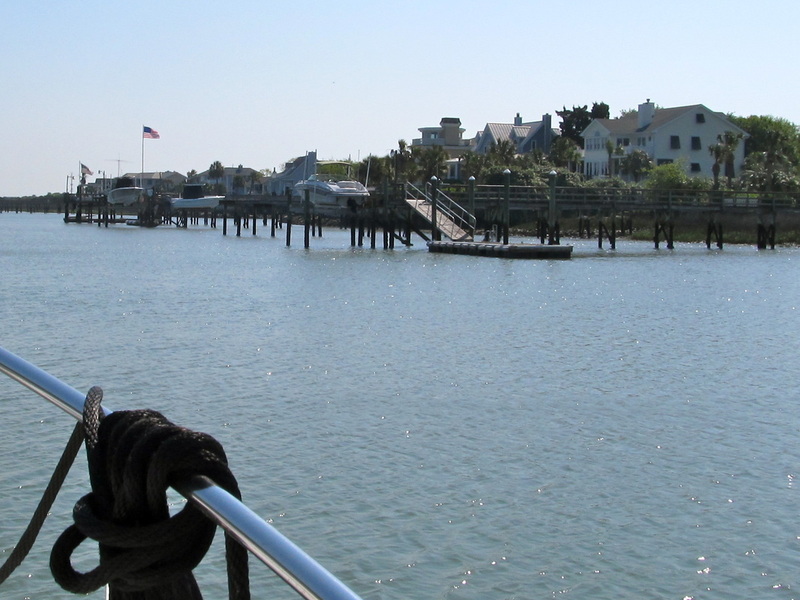 After lunch, the marina’s free taxi service took us the 1.5 miles across the historic peninsula to the Fort Sumter Visitor Center and tour boat dock. The national park annual pass was no good here as the $18 per person tour boat fee was the only charge. These big boats probably carry 200 people and set the pace and the intensity of the visitation to the fort with 5 boats a day during the season and three boats a day during the winter making the round trip. 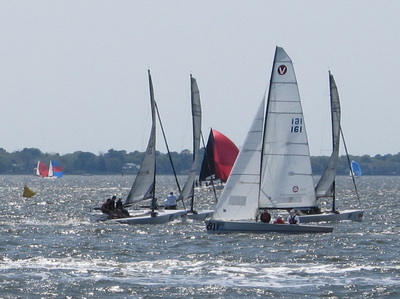 The cruise out to the edge of the harbor was punctuated by the huge sailboat races that were happening during this “Race Week” as three different fleets of boats of different size and classes competed under clear skies and 15 knot winds with gusts that added 10 more knots. The harbor was ablaze with colored nylon. Upon arriving at the fort on the same date of the attack, the ranger announced that we had an hour until the boat left. 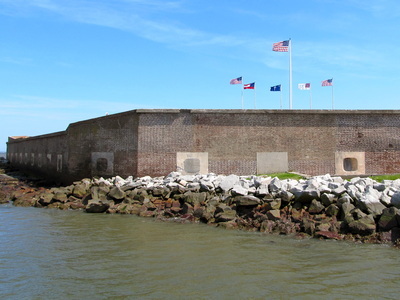 Fort Sumter’s construction started 40 years before the civil war. 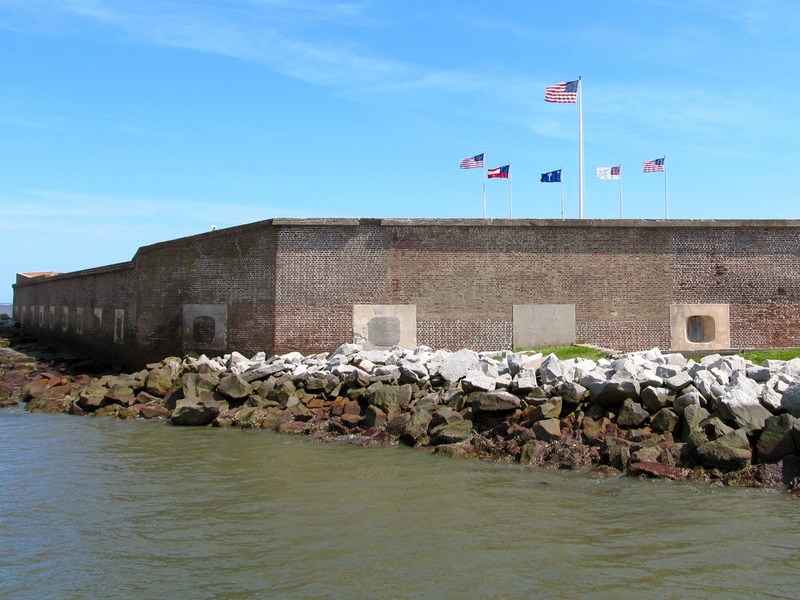 When Lincoln was elected, South Carolina seceded from the Union causing the soldiers at nearby Fort Moultrie to abandon their fort and moved to Fort Sumter under cover of darkness. For months the confederate army built up the batteries and forts around Sumter in a ring of fire. The families of the soldiers were sent to New York. Finally, in mid-April, 1861 after repeated requests to surrender the fort the Confederates launched a 34 hour-long barrage where 7 million pounds of iron rained down on the fort. Surprisingly, there were no fatalities. When the fort started to burn, the Union commander surrendered and was allowed to retreat to the north. 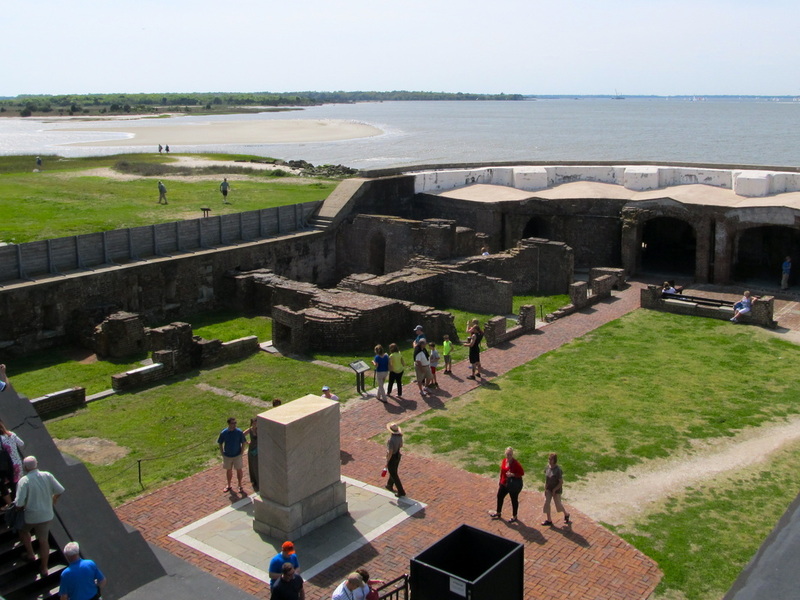 The confederate army occupied the fort and though repeatedly attacked until it was a pile of ruins, it never surrendered. 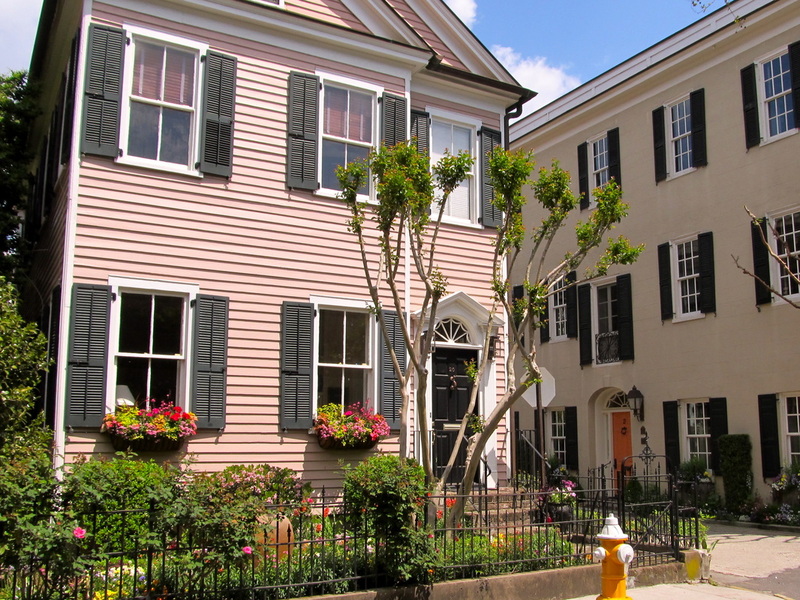 Charleston was never invaded and destroyed; it surrendered when surrounded. Cycling was the ideal way to see a lot of historic homes that spanned many decades, many styles and allowed the freedom to go around barricades, avoid parking, explore parks, and go the wrong way on one-way streets (on the sidewalk) while taking in the sights and smells of a neighborhood in a very up close and personal way. The historic district of homes and churches was beautiful. Most were fully restored and their owners took pride in their appearance. 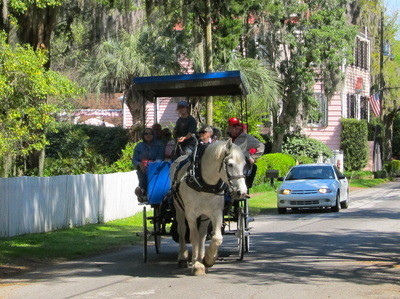 At least four different companies operated horse & carriage tours of this district and they were nearly a constant presence. Frequently, the odor of urine was like a cloud that came and went. Perhaps, that was one of the reasons that the city council had voted to not give any more operating permits for more tour companies. 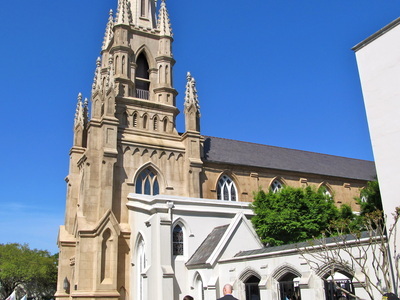 The four churches that were visited had all of these in common: they were old, the buildings and the grounds were in good condition that showed the pride of the congregation, and they had very high and ornate steeples. 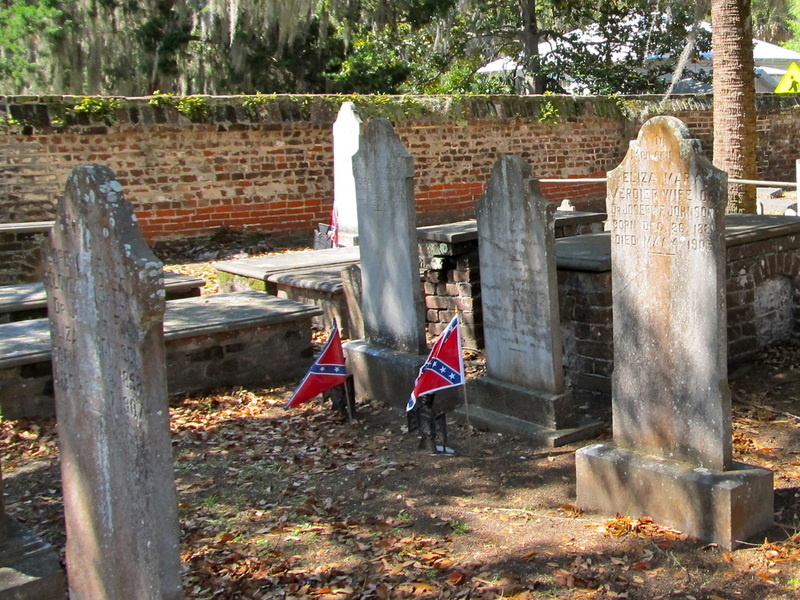 Several had graveyards attached to them that went back to the very early days. 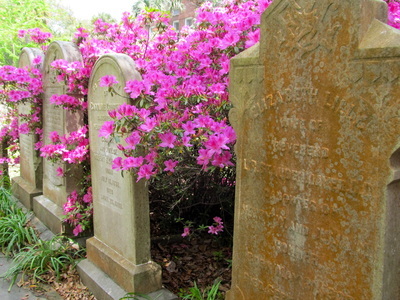 The difference between a cemetery and a graveyard is that a church is attached to a graveyard. The commercial areas on King Street, Meeting Street, and East Bay Street were active and vibrant. Another example of serendipity was this weekend there were hundreds of racers in town for the sailing regatta and the college campus was hosting a parent’s weekend. The markets were busy, the farmer’s market had a lot of diversity of products besides produce that included an impromptu break dancing exhibition and the local blue grass band was excellent. 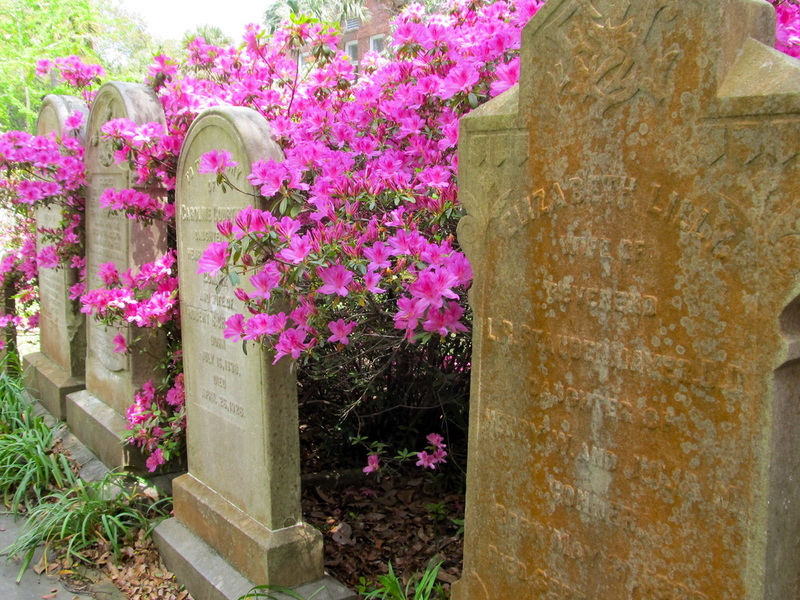 Sunday was Palm Sunday and we shopped for an Episcopal Church to visit. That search reminded us of the division within the American Episcopal Church over the issue of gays. Three of the churches we looked at broken away from American Episcopal Church over its acceptance of gays and lesbians. That issue has cooled in the Pacific Northwest but was still broiling under the surface in South Carolina. The service at Grace Episcopal was lovely with an awesome organ and a first-rate choir. 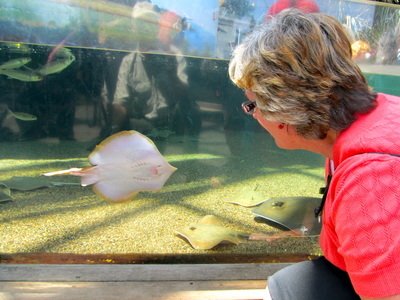 The balance of Sunday was spent at the Aquarium of South Carolina whose scope was wider than a few fish in the Atlantic. 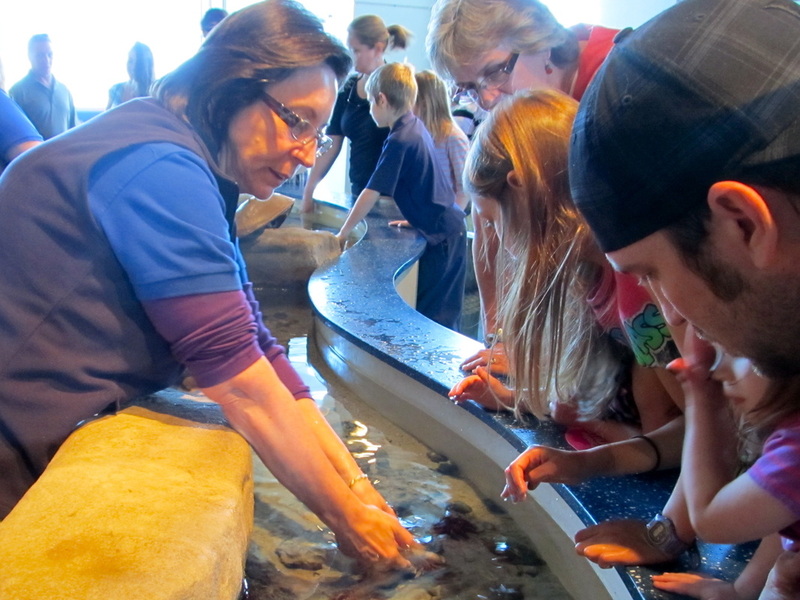 The interactive exhibits had some of the best child-friendly designs we had seen and were about oceans, animal-care, streams, mountains, swamps and Madagascar. Returning to the Mega-dock, about a third of the boats were gone. We enjoyed a light dinner of stir-fried veggies and brats while watching 60 Minutes. The weather was turning with the sky full of clouds and the promise of wind and rain coming. 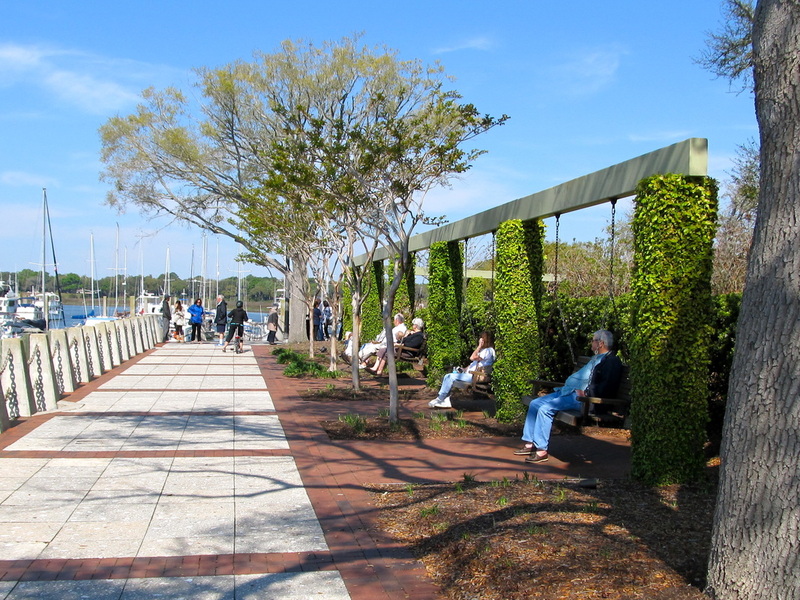 Andiamo was moved 8 miles to the Cooper River Marina that is on the east side of the Charleston peninsula and up the Cooper River. 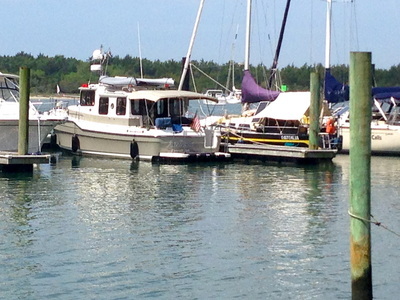 Laurie chose this marina for its close location to the airport, the security and the weekly moorage rate. We needed a place to comfortably leave Andiamo for a week while we were in the Pacific Northwest for Easter and to see family. Cooper River Marina is run by the Charleston County Parks, was a part of a former navy base, and is not close to anywhere except an industrial area. 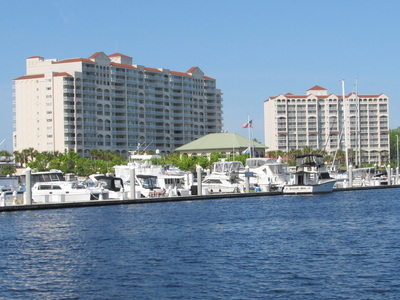 The medium sized marina is dominated by sailboats and residents of the county get a discount on the moorage rate. We were on the transient dock the first night that is unprotected from the wind and currents from the south and the night was bumpy. 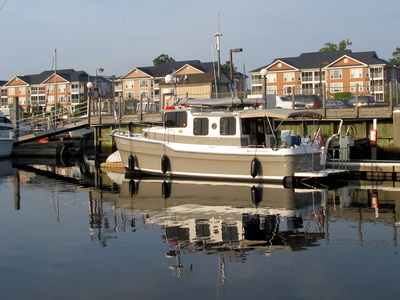 The next morning, Matt, the marina manager moved Andiamo to a vacant 30-foot slip in the marina on the second day and the protection was outstanding. With no retail or services within walking or biking distance and no courtesy cars, the marina staff took us to the grocery store and a park to fill our propane tank when they do their normal errands. 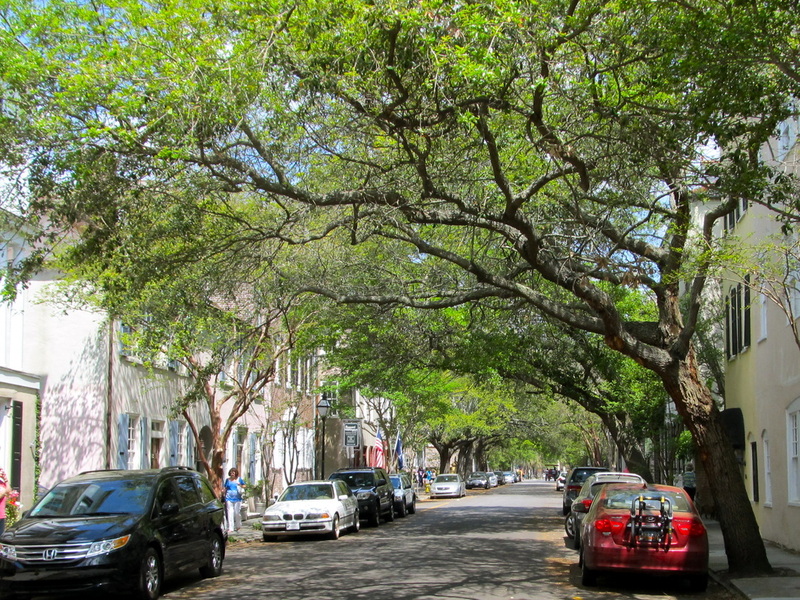 Without a time schedule, we were perfectly happy with a two-hour drive and seeing different areas of Charleston, including the neighborhoods of the poor. Laundry was done, the marina’s outstanding ship’s store was explored, and their great boater’s lounge was enjoyed with a book being traded at the lending library. With the wind staying in the mid-teens and gusting to 30 MPH, Andiamo was our refuge and we caught up on writing, did research and watched movies. The next day, we had a flight Seattle via Atlanta and Matt took us to the airport as part of his daily errands. We were pleased, yet surprised, at the level of service that Matt and his employees provided because we have had a lifetime of constraints by public employees on what they can do. Taking us to the airport fell into that category. However, it was a service that arguably we had paid for and we were happy to receive it. Jet travel is always amazing. 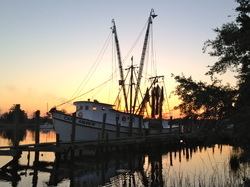 You can wake up in the morning on a boat in Charleston, South Carolina and go to bed in Marysville, Washington. For a week, we visited family and friends, took care of the business of living, had some dental work done and visited our church community. When we walked in the door of our house, we both said, “Look at all this stuff!” The house is on the smaller side with 1,600 square feet but it felt huge. Though satisfying and important, with no regrets, the visit was like having part of our lives on a boat trip and part of our lives at home but waiting to leave to resume the adventure. 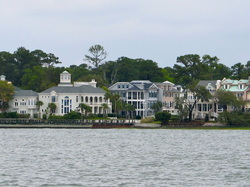 Tuesday, April 22, with Seattle having a 7-day forecast of rain, we flew back to Charleston and were picked up at the airport by a marina employee. We were back on Andiamo by sunset. A rainstorm had passed through during the night leaving everything wet but the morning was bright, clear and the water was smooth. We left as soon as the marina office could take our key and accept payment for the moorage. 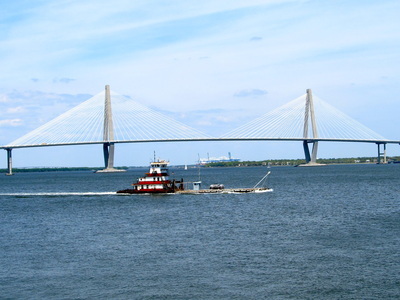 Leaving Charleston Harbor and passing under the I-526, Mark Clark Expressway Bridge and past the aircraft carrier Yorktown, the harbor was quiet and Andiamo turned to port near Fort Sumter to reunite with the ICW at Sullivan’s Island. 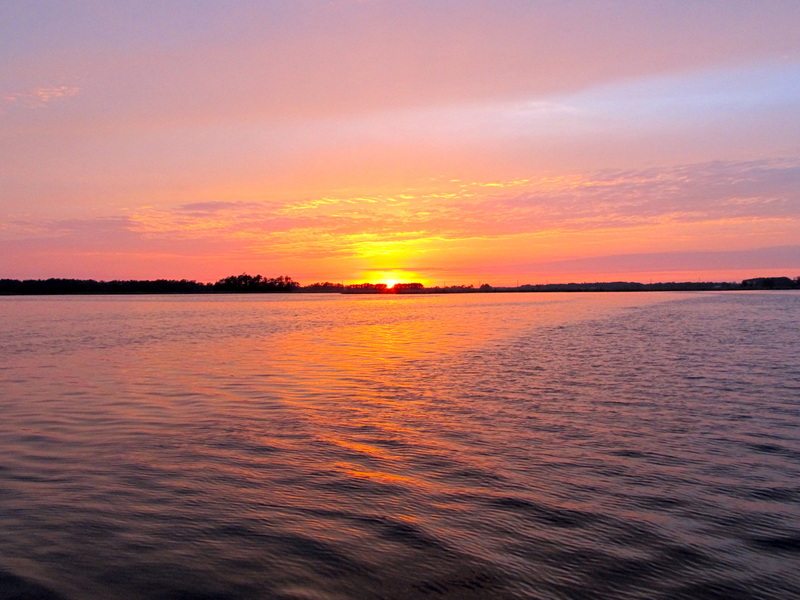 The currents would be with us most of the day and the rising tide on the ICW would be welcomed. However, at Meeting Reach, the depth alarm went off when only 2 inches of water was under the keel. Andiamo was put in neutral and we continued to drift with the current, not feeling the bottom as the depth went to -.3 inches meaning the keel and the protected prop and rudder were probably slicing through the silt and mud. But we did not feel it. Past the Isle of Palms highway bridge, the water deepened to a comfortable 5 feet of water under the keel. At Sewell Bay, the marsh was like a Sea Prairie where the marsh grass was below knee-high and it extended far to the east to where it met the ocean. This trip had many long and narrow stretches to it. Sometimes, there was no evidence of humanity. 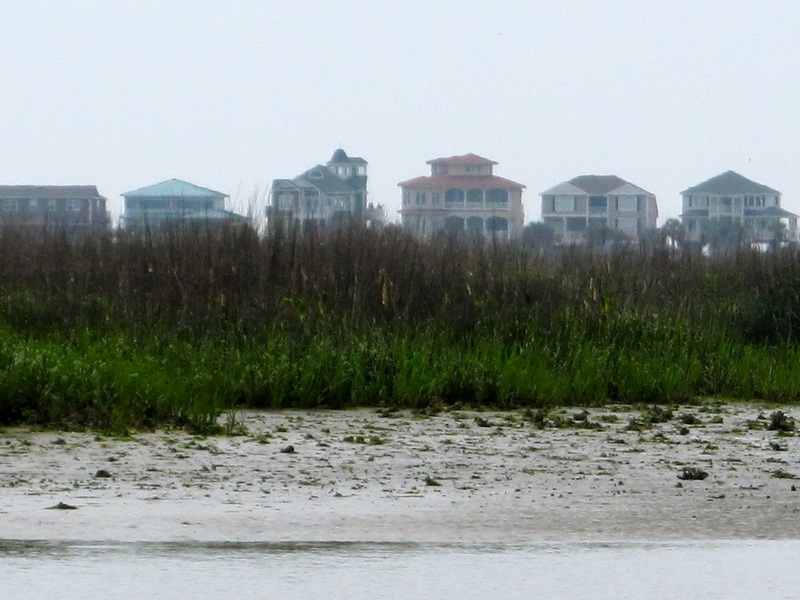 Other times, the shoreline was stacked with houses that seemed vacant and every house had a long dock to the water. 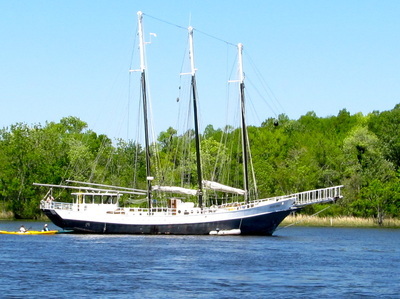 Andiamo continued on the Harbor River, past Murphy Island, the Santee River and finally into Winyah Bay. 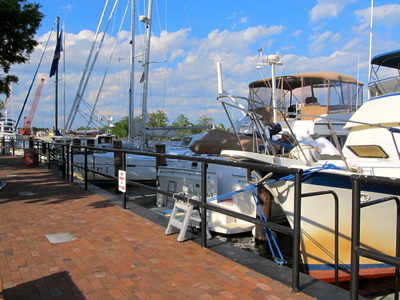 Andiamo’s destination was Harborwalk Marina in Georgetown. We traveled nearly 75 miles and arrived in the late afternoon, docking behind Alan and Kathy’s Panacea that we last saw at Lady Island Marina in Beaufort. Anxious to stretch our legs, the bikes were unfolded and we set off to the grocery store to re-stock some essentials. The Piggly Wiggly grocery was in the low-end of town. We mistakenly locked the bikes to an unmarked bus stop. I felt uncomfortable leaving the bikes with people who set off my “crook meter” so I stood guard while Laurie shopped. It is amazing how much space packaging takes up. After all the packaging was stripped off, the half-full shopping basket of items easily fit into two saddlebags and a big daypack. Back at Andiamo, after everything was packed and stowed we had cocktails in the shade and then went to the Wildfish Grill for an outstanding dinner of fish tacos and shrimp over grits. 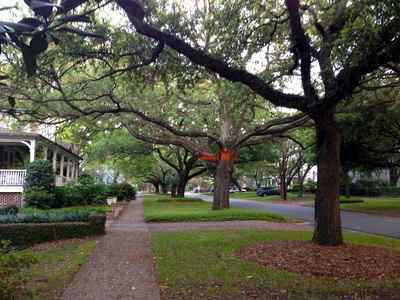 The day was closed out with a pleasant walk in the historic district where homes were built over 200 years ago. 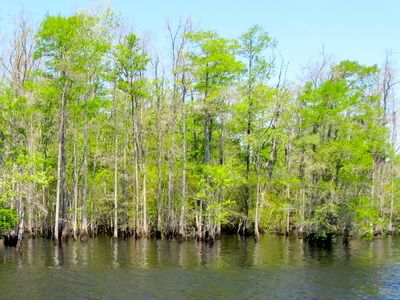 Spring time boating in the Carolinas brings clear blue skies, temperature in the mid-70’s, with a cooling and pleasant breeze that keeps the bugs at bay. 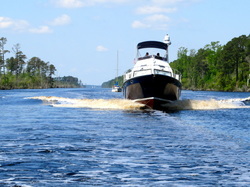 Thursday, the Wacamaw River was Andiamo’s waterway heading northeast as the Carolina coast juts away from Georgia. The morning breeze gave lending hand to ease the tug away from the dock. 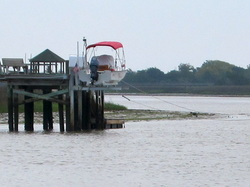 The river’s westward current was amplified by the lowering tide that caused Andiamo’s speed to drop by nearly 3 miles per hour. The advantage of the Ranger Tug is the ability to power up and transform itself from a slow tug to a cruising powerboat that can over come the wind and current. Yes, the tug used more diesel, but the Wacamaw River would otherwise fight our progress for three hours. So, Andiamo ran at 13 MPH for nearly two hours. 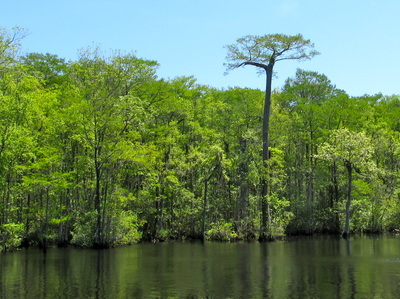 The low country of Georgia and South Carolina melted away and the cypress trees came back. This was the serendipity: the rising terrain and the visual relief it created. These trees were logged off nearly 200 years ago to create huge rice fields that produced the most rice in North America. Today, the abandoned rice fields are the reminder of the productivity of yesteryear. New, planned residential developments are rising among the cypress trees. 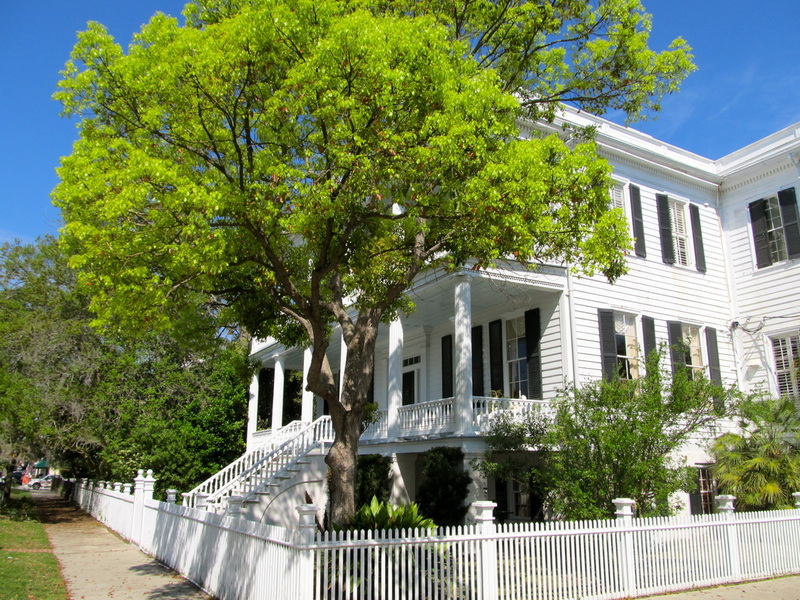 The marketing term is “Plantation-Style Living” which, in my northern orientation, I found problematic. So, does each place come with a set of slaves? What were these developers thinking when they named it? The Intracoastal Waterway is often separated from the Atlantic by marsh and a long spit of land that is most often highly developed with wall-to-wall, multi-story buildings. This continuous line of condos, resorts, and high-end houses has created a new man-made vertical barrier. With the exception of a few towns, the ICW is clearly the stepchild of the development with some huge homes on large lots and modest homes and some trailer parks and campgrounds. 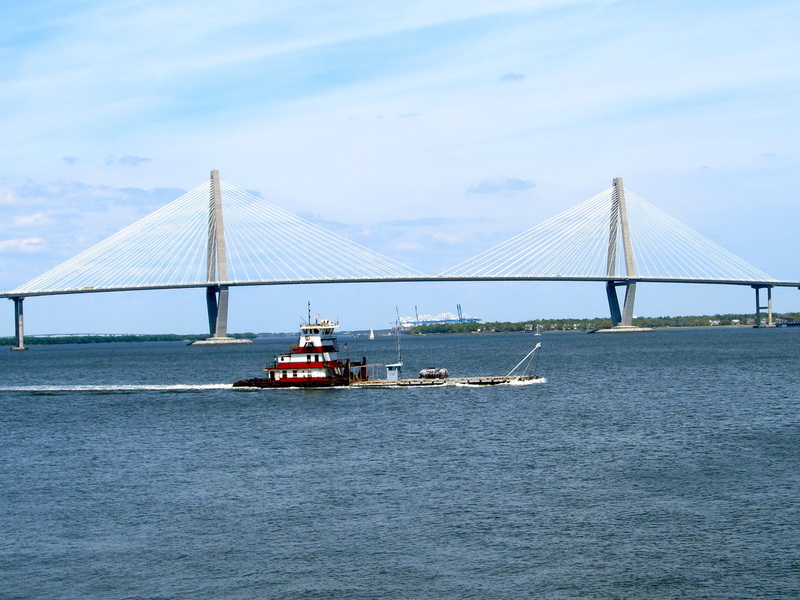 Wherever there is a bridge leading to the ocean, the urban development springs up around it. The lesson: if development is not wanted, do not build a bridge. 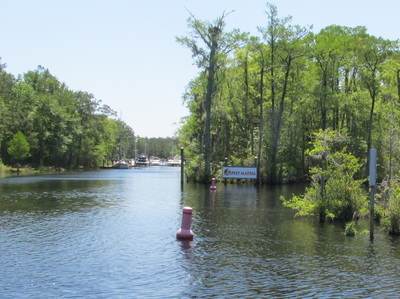 Off the river and on a cut through the cypress swamp, Osprey Marina was found by going down a narrow and scenic channel to a nice marina and the best fuel prices. Though not desperate for diesel, saving 30 cents a gallon was worth it. Andiamo burned nearly 3 gallons per hour that resulted in about 3 ½ miles to the gallon. This was a bit lower than other parts of this trip but we had been fighting more current than before. 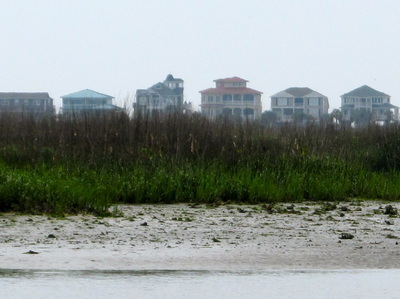 Myrtle Beach had taken out most of the trees, built about 120 golf courses and a whole lot of high-end homes. Who are these people? We were on high alert as Andiamo transited the 2-mile long “Rock Pile” that has rock shelves instead of mud and silt. The “Rock Pile” is written about extensively in the cruising guides. We found it to a nothing if a boat stays in the channel and follow the channel markers that the Coast Guard has dutifully installed. There were other more problematic areas that we had encountered that did not have the warnings. 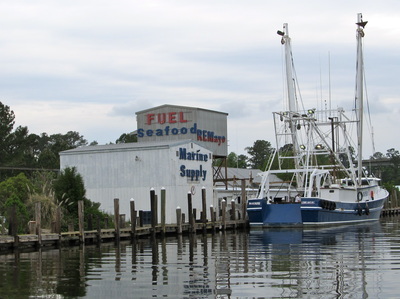 The destination was the Myrtle Beach Yacht Club and though we got delayed behind a swing bridge, the after hours staff, a live-a-board, welcomed us at the fuel and pump-out dock. 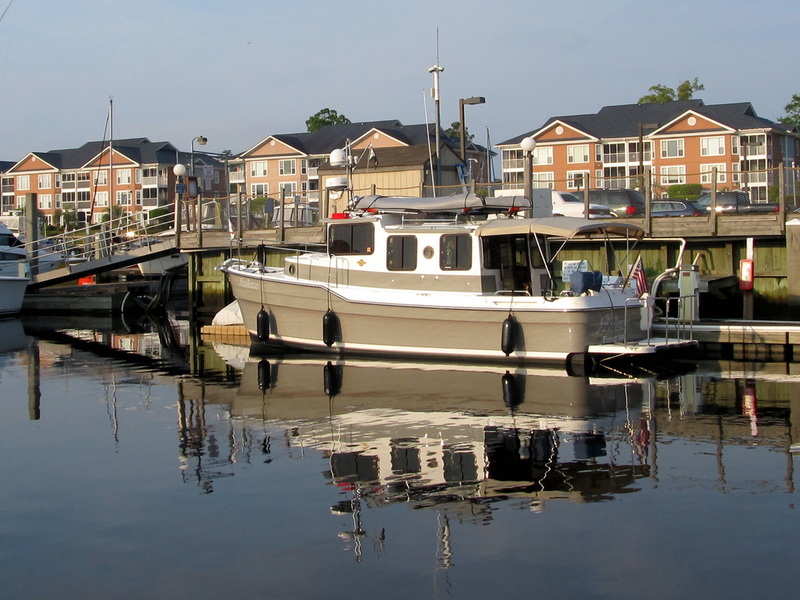 It was quiet, protected, the cheapest moorage around in this high-rent district and we met Ken and Lois who will be starting the loop on their 44 foot Nova trawler. Andiamo had traveled 60 miles. The next day, Andiamo was pumped out and the water was topped off to finish the “re-set” of her systems. 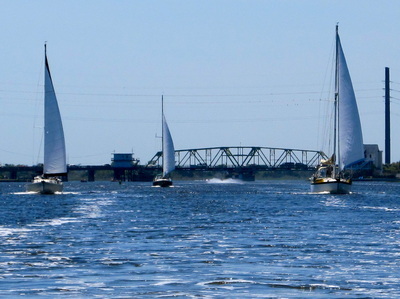 This day, tug would take us 37 miles to Southport that is at the tip of the Cape Fear River and very close to the Atlantic. This leg would finish the predominately easterly direction because the ICW turns north after Cape Fear. 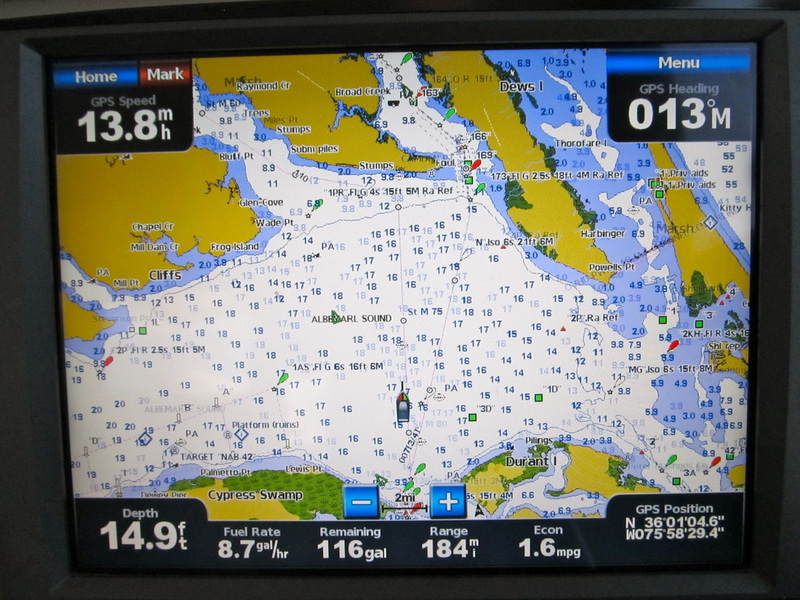 This was a slow travel day as the currents were mostly against us but not to the intensity of the day before. We accepted the loss of 1 to 2 MPH and enjoyed the scenery. Andiamo crossed into North Carolina five miles into the day’s trip. 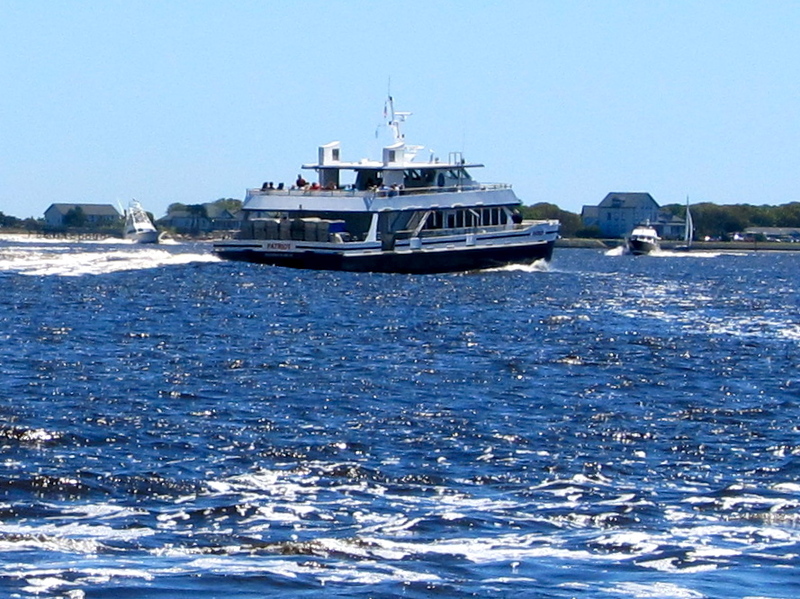 Long and straight stretches of water that was interrupted by small outlets to the ocean dominated the day’s boating. The current would change depending upon which side of the outlet the tug was on. The channel was generally narrow. 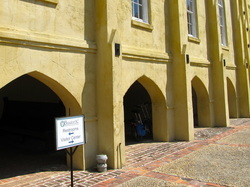 Shallotte and Lockwood Folly’s were two outlets that were narrow, winding and advertised as problematic. However, the Army Corps of Engineers had recently dredged these because they had received supplemental funding from North Carolina’s boater registration funds. 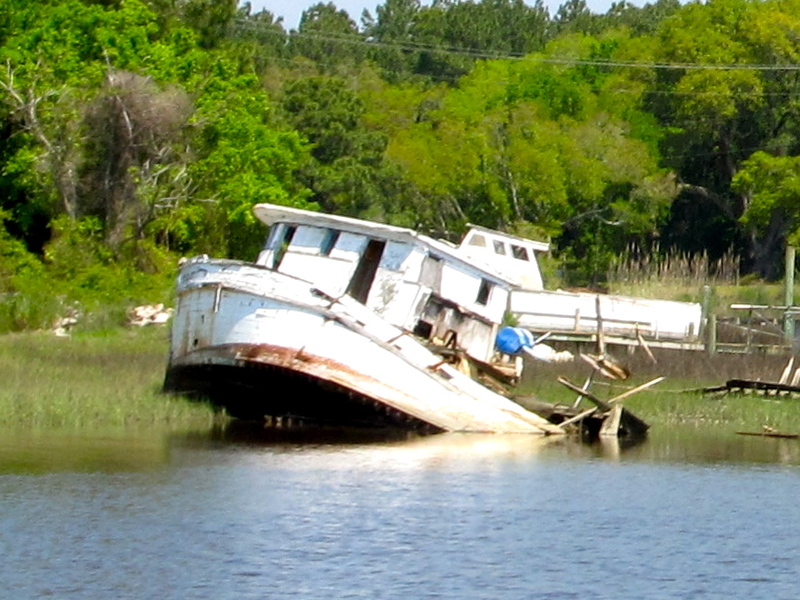 We encountered more boats than anytime since the west coast of Florida. Perhaps, because it was Friday, maybe a school holiday, or there are more boats in North Carolina. Nearly every slant-bow, center-console boat that overtook and passed the tug did it within a boat length away and at 25 MPH. It was close enough to pass a beer back and forth. 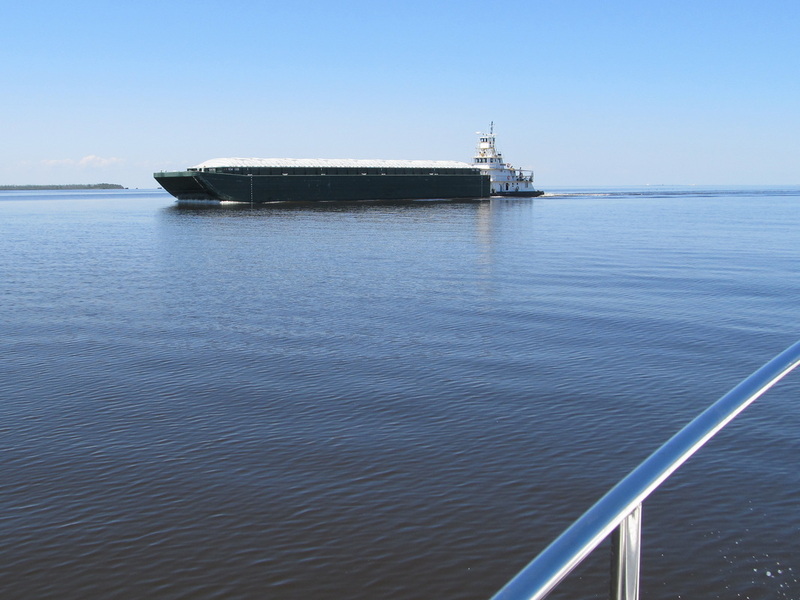 The largest wake, and a very dangerous one, came from an ocean-going sport fishing boat. This 30 foot craft, powered by twin inboards overtook and passed Andiamo going 35 miles per hour at less than a boat length away and created a 4 to 5 high wake. If taken on the tug’s beam, it would have laid the tug nearly on its side as the wake swept under us. Another time, as one center-console fishing overtook and passed us, another on-coming center-console boat with its 200 HP engine wound-up, evaded the smaller craft and turned into us, narrowly missing Andiamo’s aft corner with the female captain screaming at us the whole time. Mid-afternoon, the tug arrived at the Southport Marina as the south wind was building. The wind was forecasted to build though the night as a weak front was passing through. The bikes were set up and the afternoon was spent exploring this town of 2,800 people. The maritime museum provided the historical background of this region. 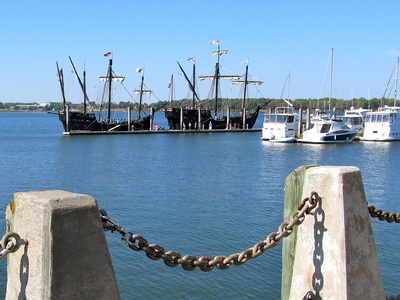 A story of Native Americans who were enslaved, of massive shipwrecks, a haven for pirates, yellow fever disseminating the population, the only port that the union army could not blockade during the civil war, and where fish and shrimp were over-fished in 60 years that flattened those industries. The marina offered a briefing on weather and navigation issues by a retired naval officer for cruisers and was attended by 10 other cruisers. This daily event is an amazing event that is co-sponsored by two other businesses at the marina and brings the cruisers together for an hour for current issues and concerns. This is the beginning of the “Graveyard of the Atlantic” where hundreds of ships wrecked on the Atlantic shore. We are inland but the forces at work are apparent. The currents and winds on the Cape Fear River, which is very close to “The” Cape Fear, dictated the decisions for the day. Some things are just out of our control and this is one of them. The ebbing current, the flow that goes into the Atlantic Ocean peaks out at just under 4 miles per hour and the winds were shifting around the compass as a weak low pressure was passing through and on its way out to sea. 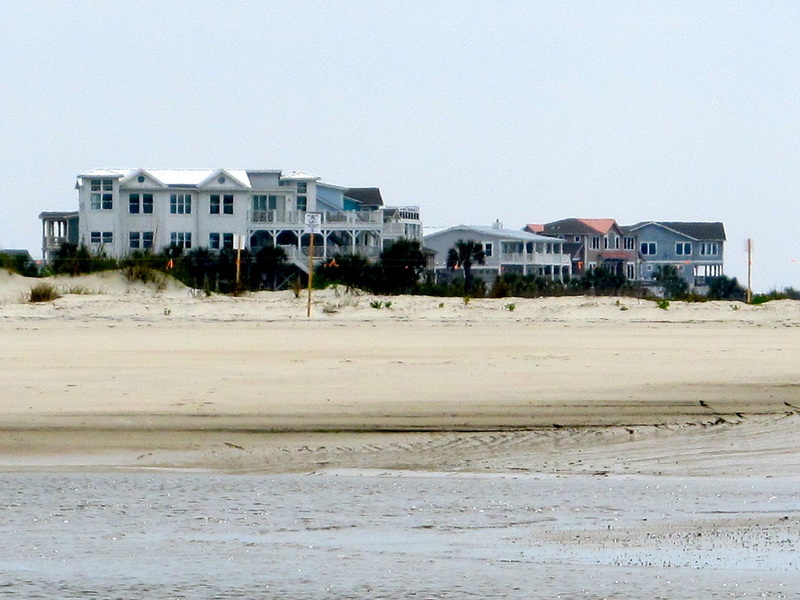 Given the choice of leaving at 0800 hours or earlier or leaving at 3 PM, we opted for the later and making the 12-mile trip to Carolina Beach State Park. On a beautiful Saturday morning in spring, the docks were explored and the waterfront community was walked through. The Southport Marina is one of the top tier of “nice marinas” that cater to the big yachts. They are flush with scurrying staff members in their blue polo shirts as they help yachts land and leave and handle the fuel and pump-out needs and the clubhouse’s deck was booked with a wedding. Laurie made bread in the oven and lentil soup. Books were read and logs were written. Mid-afternoon and the winds and current were not ideal for leaving as Andiamo would need to back into the wind and turn into the narrow space between the land and the fuel dock. All was executed flawlessly because there was a plan. 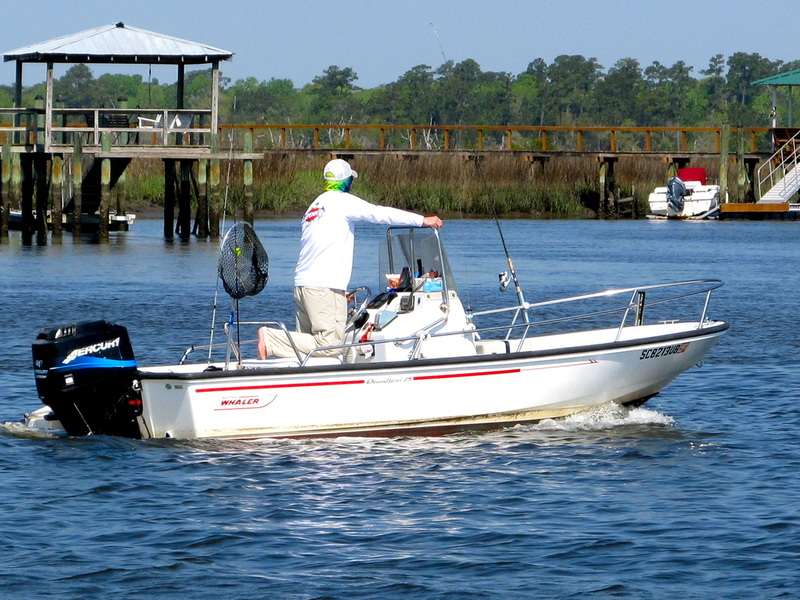 The Cape Fear River was immediately upon us with a 1-2 foot chop and was crowded with boats. A 3-foot high wake that was thrown up by an offshore sports fishing boat crashed into Andiamo’s beam that caused the tug to tip wildly from side to side. The contents of a bottle of white wine were the sole casualty. Apologies all around as the captain did not turn into the wake and the chief wine officer did not secure the bottle during preparations for departure. 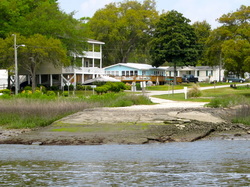 Carolina Beach State Park is on the corner of the Cape Fear River and Snows Cut that connects the river to the protected waterway by Carolina Beach. 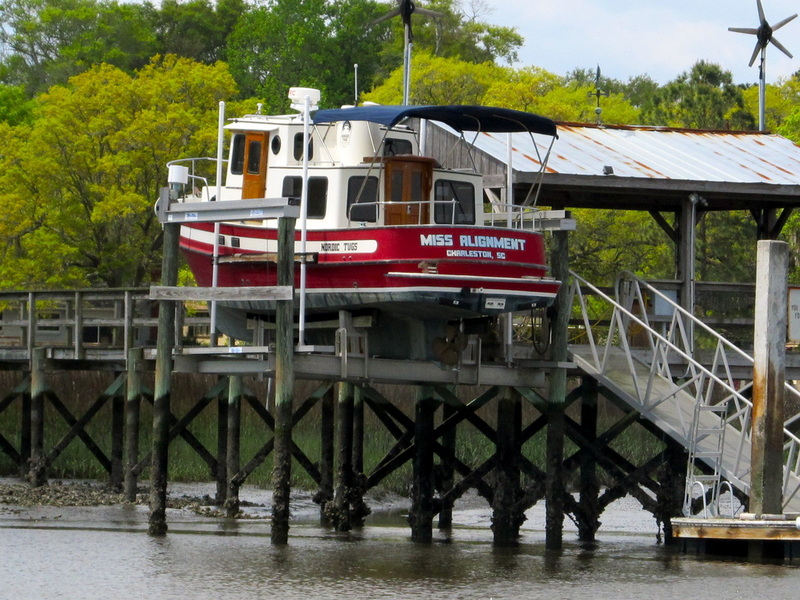 This is the only marina that the State of North Carolina operates. 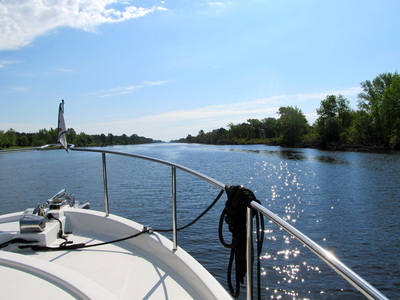 Though the opening to the marina and the fairways were on the tight side, the docks were new, there was plenty of room for boats that are less than 40 feet long and the price was great: $1 a foot that included power. The bikes were set up and we cycled the mile through the park, took in the campground and the visitor center and learned that this is the only park where the Venus Fly Trap, a carnivorous plant is native. We continued on for another ½ mile to wonderful grocery store and filled up the bike bags. The evening was closed with brauts on the BBQ and nice conversations with George and Cynthia on their Nordic Tug 32 who are on their way back home in Maine. 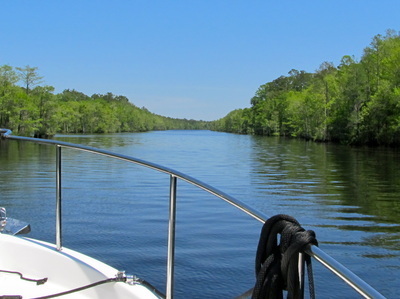 Today’s Serendipity: was the small world of boating as they had wintered in Florida and met Rich & Cheryl on Roam and Mike & Jess on Illusions. The next morning we awoke to the sound of diesels and boats leaving as George and Cynthia were heading out and a nearby trawler, Mischief, was leaving. Andiamo backed out and caught the fast moving, eastbound current in Snow’s Cut an hour later and slipped on by the beach community of Carolina Beach. 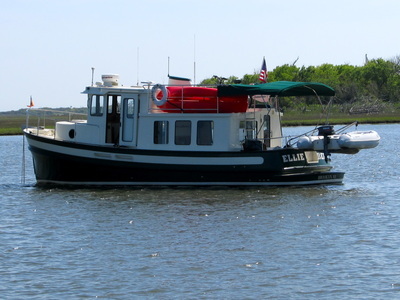 The tug rode the 2 MPH current to Wrightsville and its high density of marinas, under a highway bridge, that was packed with yachts and day boats. 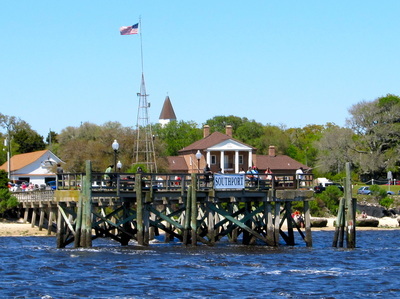 Wrightsville is a suburb of Wilmington and is the high rent district for the city. Even the marinas are high-rent with moorage rates of $2.50 per foot. It was also the only no wake zone of the day. We skated on to fight currents, which would ease, and then switch to carry us as another outlet to the ocean was approached. The water quality became noticeably clearer than the rivers and the brackish water that was experienced for the past 6 weeks. The shallow water alarm went off twice on this day. 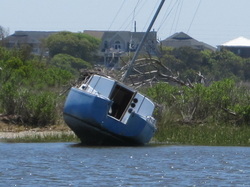 It is set to alert us when there is 3 inches of water under the keel. 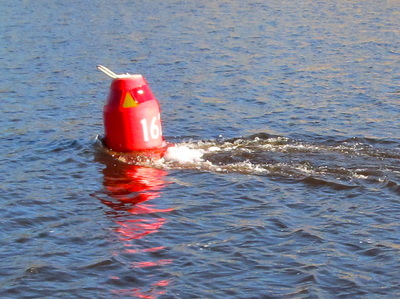 The first time was at the Black Mud Channel and the green channel marker, number 99A. At the briefing at Southport Marina, I learned that this is a problem area but the location of the channel marker, being so far away from the shoreline, indicated to me that the Coast Guard had moved it as a response to shoaling. This was not the case. With the channel only 50 feet wide and three fast boats approaching, I watched the depth start at 10 feet, go to 5 feet, then 2 and then the alarm sound. Drop to idle speed, avoid boats and make a sharp turn to the other shore and Andiamo slid on through. The second time was at the Surf Island Swing Bridge, an old highway bridge that is the first bridge we have encountered that only opens on the hour. 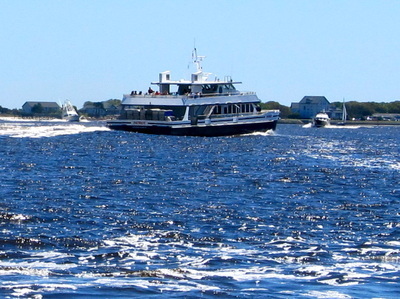 Andiamo had adjusted its speed to minimize the wait time and we were slowly idling away from three sailboats and staying clear of the go-fast center console boats when the depth alarm sounded just as the bridge was starting to open. 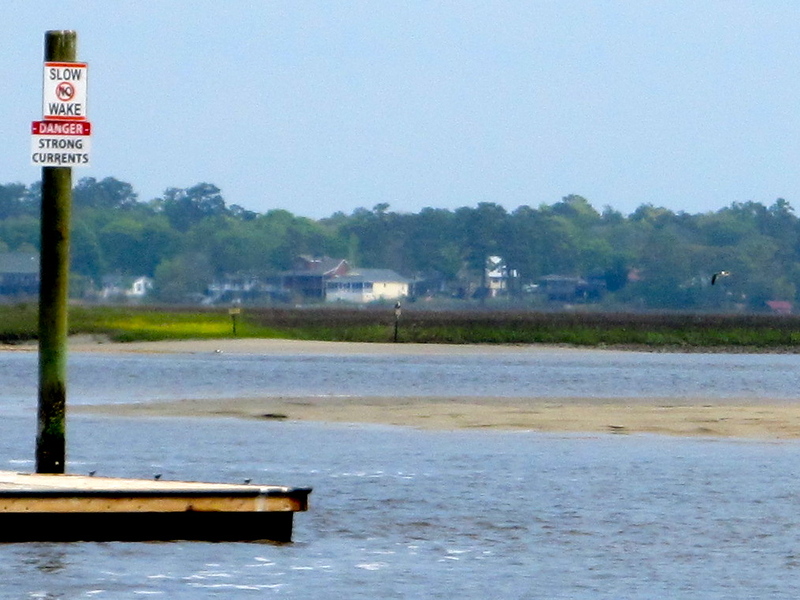 I had thoughts of sitting in the mud, waiting for the tide to rise and missing one or two bridge openings but, again, Andiamo slid on through. 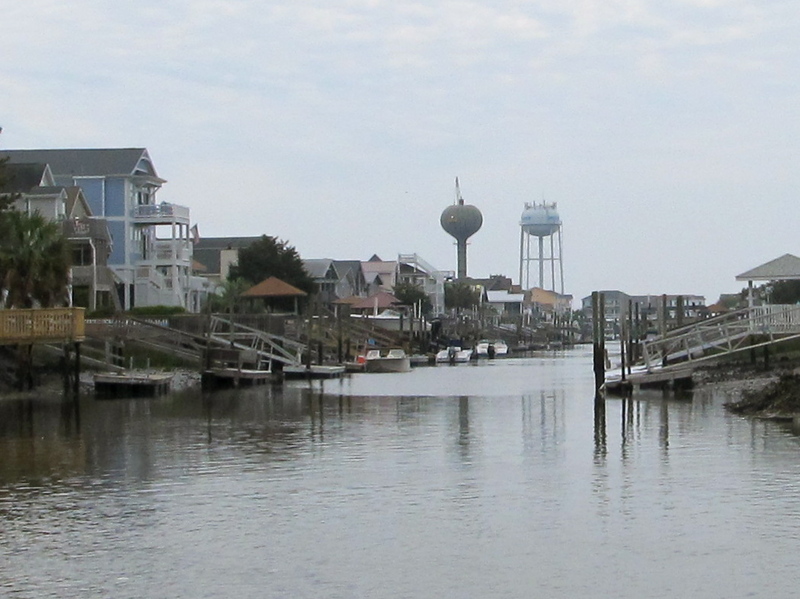 Continuing through Topsail Sound and Stump Sound, the flooding tide carried us along, and the weather continued to be spectacular with no hint of the tornado that had sat down 100 miles north of us two days ago and sent 16 people to the hospital. The destination was a public anchorage in the Camp Lejeune Marine Corps Base called Mile Hammock Bay. 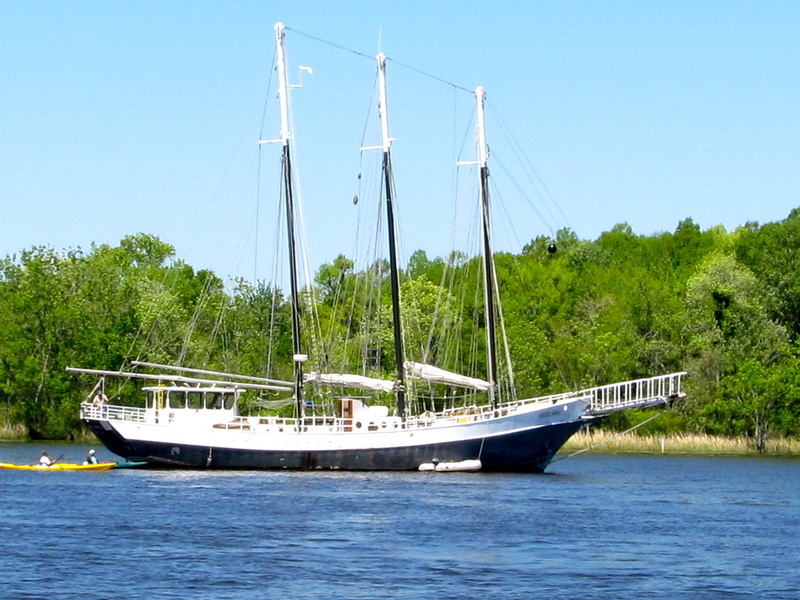 Andiamo had traveled 52 miles, the anchor was dropped in 12 feet of water, a sting ray came to the surface to check us out, and we settled in between “Mischief” and George & Cynthia’s Nordic Tug. The wind rose during Monday’s early morning hours and shifted around the compass causing the tug to pivot around the Ultra anchor. By sunrise, the winds were calm and the water was flat. Mischief left immediately, one the sailboats left a short time thereafter and we left, following the Nordic Tug. Andiamo was adjusting her speed to minimize the wait at the Onslow Swing Bridge that opens on the half-hour. 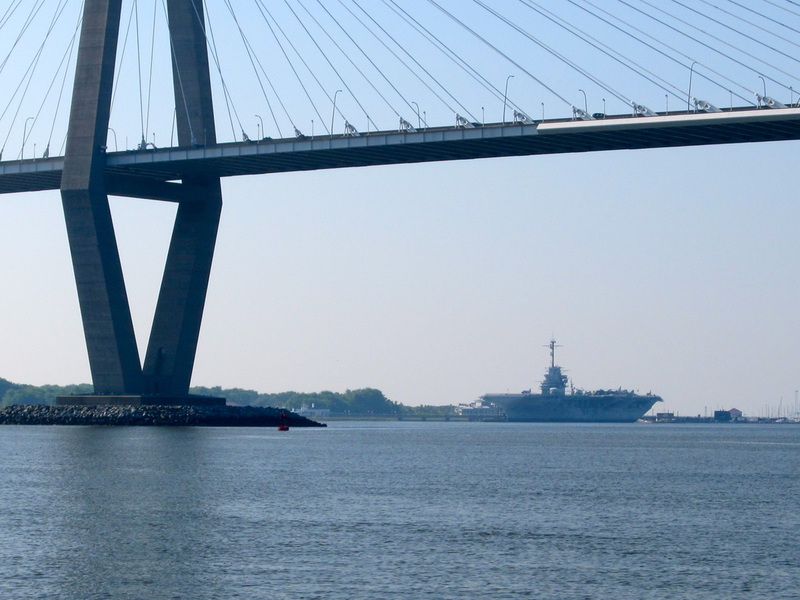 This bridge is within Camp Lejeune and is owned and operated by the Marine Corps and whose bridge tender was very precise about when the bridge would open and very specific, if not rigid, about not waiting for boaters when the bridge was open and the boater was not close enough. Through the bridge and we were in one of the 80 live-fire ranges on the base and were greeted with signage warning about not landing or anchoring or stopping. The marines close the ICW when they are firing over it. They were not on this day. 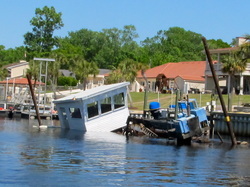 However, when we heard and felt the deep sound of an impact, the first thought was that the tug had hit a submerged log. When the third one was felt, we knew it was distant artillery practice. 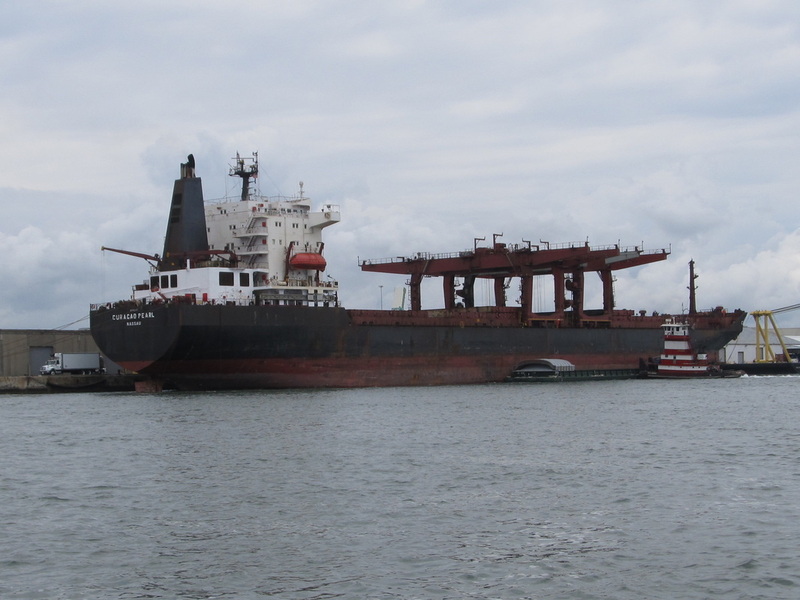 Just outside the base, we met our first commercial barge in many weeks and glided past the huge, and now closed, Hatteras boat plant. Entering Bogue Sound and the community of Swansboro, Andiamo had been riding with the 1.5 MPH current since Camp Lejeune, and now we slowed. Dolphins, Canadian Geese and white herons were enjoyed. Andiamo was heading nearly due east and as we approached Moorhead City, the current grabbed the tug and propelled us on, adding 2 MPH to our speed. 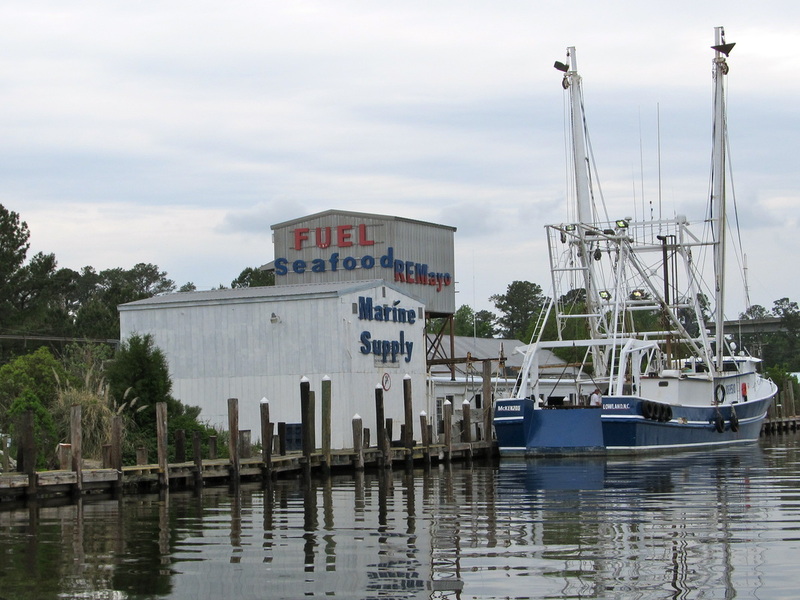 Morehead City is the commercial and industrial hub of this tip of North Carolina. 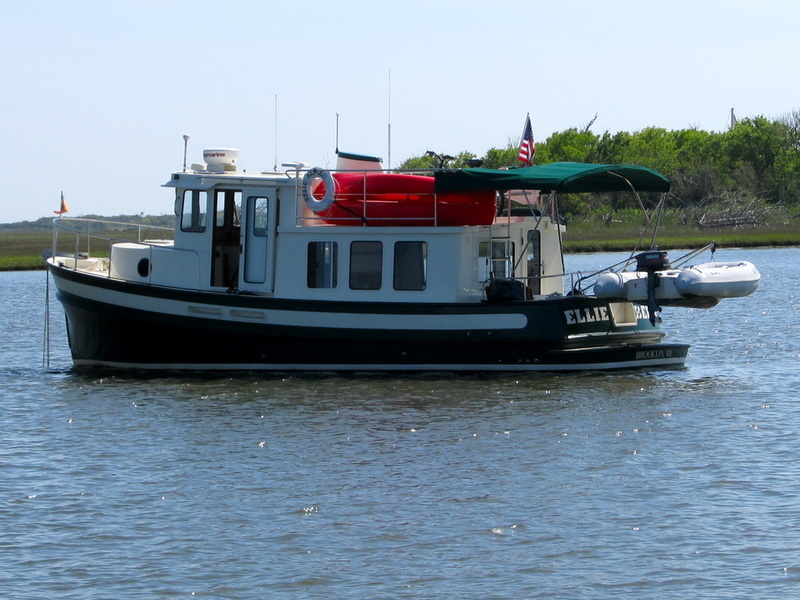 We followed George and Cynthia’s Nordic Tug through the maze of buoys and turns and the channel out toward the ocean, only to turn hard to the left and up Taylor’s Creek to our destination at the Beaufort Town Docks. George and Cynthia had disappeared to go to another marina. Andiamo had travelled 44 hours this day and finished the month with 403 miles and the trip to date of over 1,600 miles. 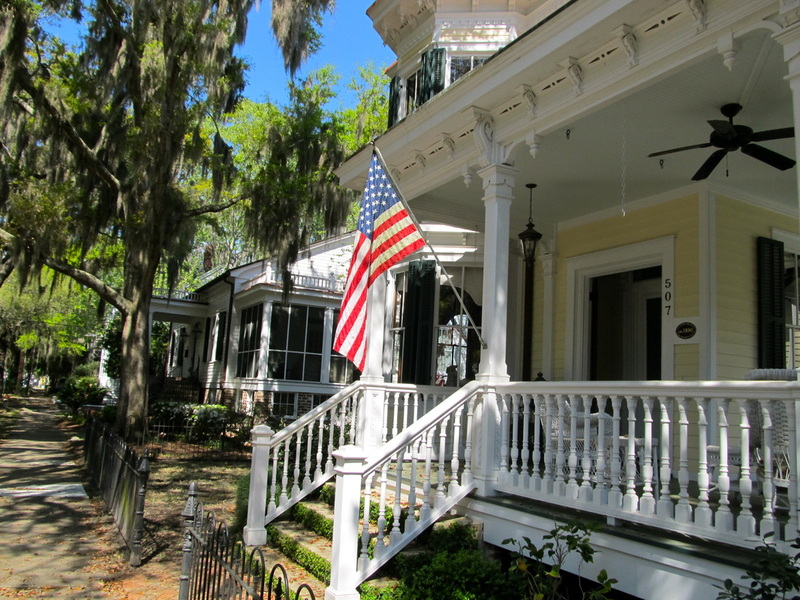 We stayed in Beaufort (pronounced BOH-fort) for four nights to wait out a weather front that caused headlines around the country when tornados caused death and destruction, and flooded communities throughout the south. We saw none of that except for an intense rain that accompanied a thunder and lightning storm Wednesday night. Because we were snug in the marina, the weather was entertaining and though the mid-cabin berth got a bit damp from an unknown leak, it was all taken in stride. 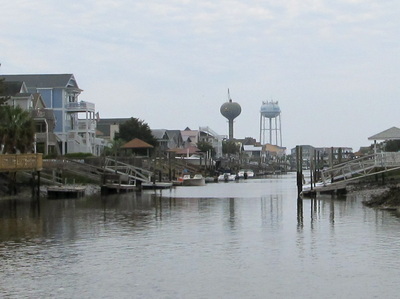 This is the southern portion of the outer banks region. 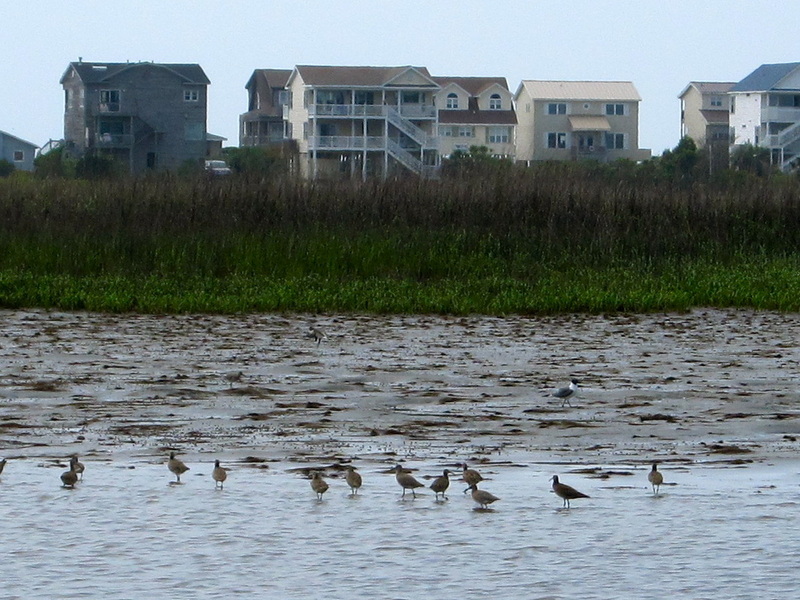 This part of the outer banks is not easily accessible without a car. Intending to further explore Kitty Hawk and Cape Hatteras to the north, we may rent a car in Norfolk, Virginia. 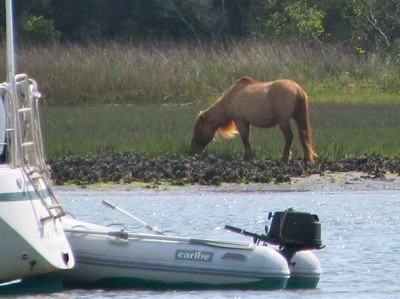 Closeby is the National Seashore and Rachel Carson Reserve where small wild horses that were abandoned by colonists centuries ago are visible. The history is piracy as Captain Blackbeard wrecked his flagship here. 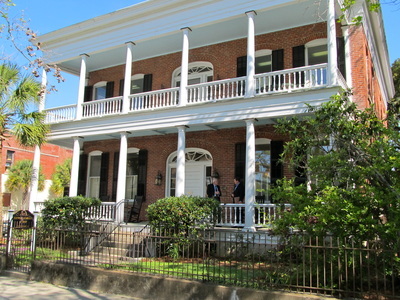 In the 1990’s it was found, excavated by the state and the artifacts are prominently displayed at the Maritime Museum in Beaufort. Fishing and whaling dominated the industry until they collapsed. Now, the region is dependent upon tourism and a limited about of import/exports. 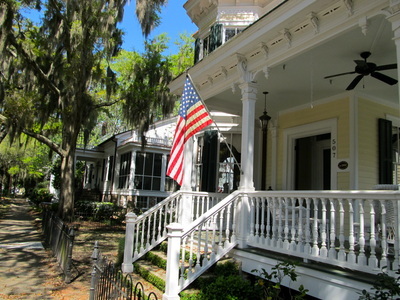 Beaufort’s historic district is about two blocks deep and 12 blocks long. We would walk it several times, bike it and drive it during our stay. 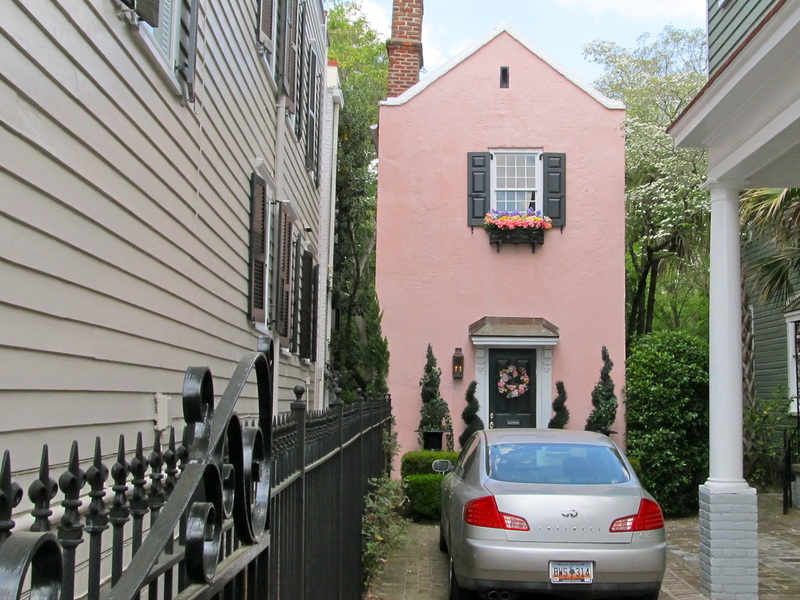 We walked most of the length of Taylor’s Creek through the old town and into the newer homes. The marina’s courtesy car was used to do a deep provisioning run and laundry was done. We cooked a frozen apple pie in the Andiamo’s oven, another first, and enjoyed it for four days. The maritime museum and the wooden boat shop were visited twice. Our 35th wedding anniversary was celebrated here with a fine dinner, rum drinks and finished with key lime pie. During the stay, several movies were watched, the local news was entertaining, and books were started and finished. Lots of time was spent looking at the websites we use to make destination, route, fueling and timing decisions. The weather was the determining factor, not the rain, nor the moderate winds of 15 to 25 knots but the wind-caused waves in the two sounds that were on the next leg of the trip. 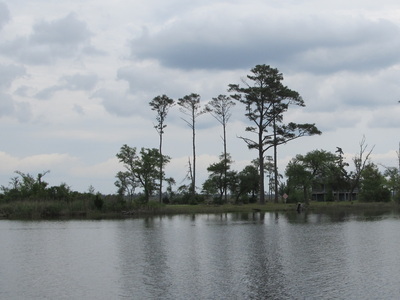 Pamlico Sound is wide and open to the east, where wave heights of 2-3 feet are normal on a calm day. During this weather system, wave heights of 7 to 8 feet were predicted. The “fine print” in these predictions indicated that these numbers are for 80% of the waves. Meaning 20% would be higher. We needed to stay put. We had lots of conversations with boaters around us. Some left to make the schedules on their calendars, more arrived to this safe haven, and some like us, just stayed. George and Cynthia found us on the main street and liked our marina better than theirs. An owner of a 63 foot Trumpy yacht from Michigan visited with us several times, gave a tour of this yacht and offered dockage in Michigan. 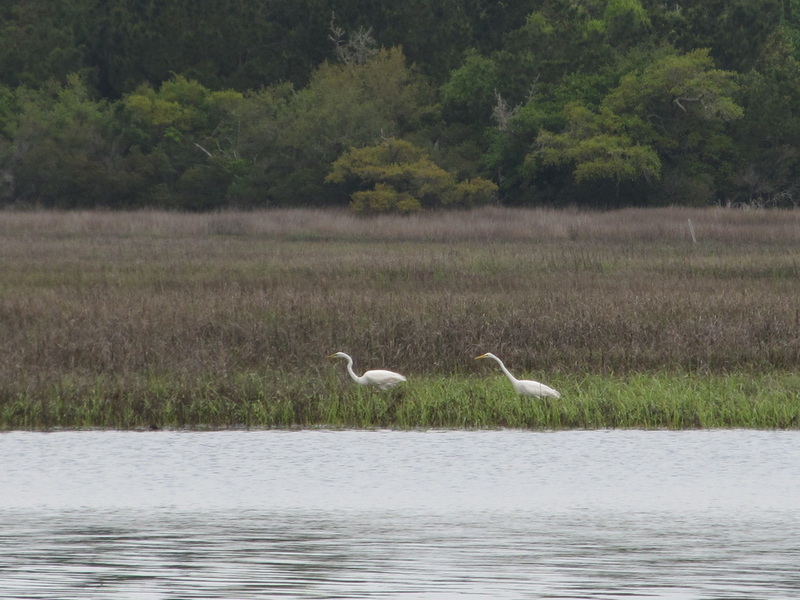 The wait in Beaufort was worth it. For the next two days we traveled the longest canal, the widest sounds, and wide and long rivers. These would be the longest travel days experienced so far with 77 miles and 80 miles. 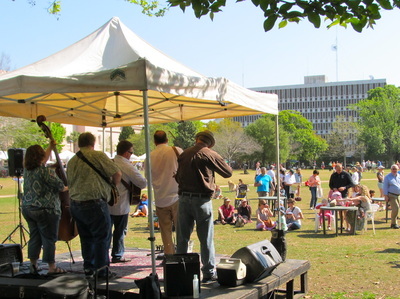 The length of the travel was done to take advantage of the weather. However, there are fewer marinas, anchorages and opportunities for fuel and this resembled the St. John’s River in Florida. These waters are the most feared on this part of the country, they are the most remote and offer few services or assistance. The wait was worth it because the weather was perfect for power boating with flat, calm waters and winds were light and variable. Friday, we left early at 0745 and stopped at the pump out station. North Carolina does not do pump out stations as well as other states because they are not as available, they charge more, and the technology generation is behind. 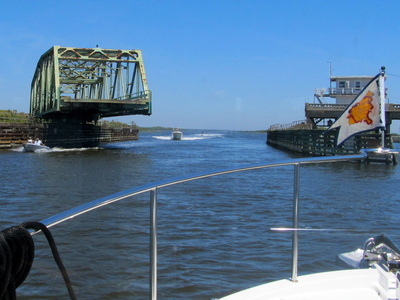 Then, we slid under the Beaufort Bridge with inches to spare and headed up the Russell Slough to join the main channel at the Newport River. 30 miles later, we entered the wide Neuse River and could see sailboats entering and leaving the bay at Oriental. 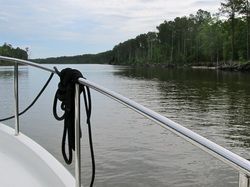 Then, Andiamo had 25 miles of open water, the Pamlico River, that is the southern part of the huge Pamlico Sound. 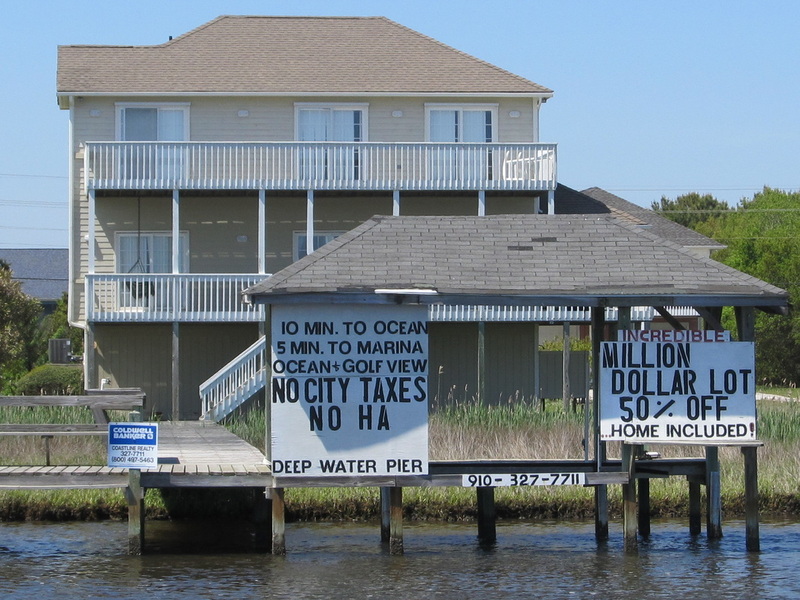 70 miles to the east is Cape Hatteras. 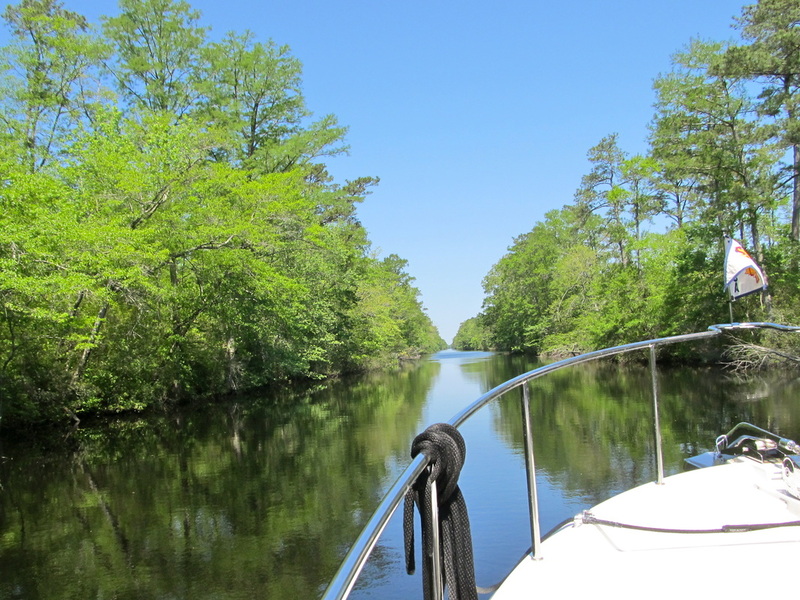 We continued on the long and wide Pungo River and anchored off of the Intracoastal Waterway near the headwaters of this river. The anchor was dropped in 6 feet of water with 8 other boats and the night was quiet with the water calm and flat and a great sunset. The next morning Andiamo left early but was not the first boat to leave the anchorage. We immediately entered the 22-mile long Pungo River/Alligator River Canal that is nearly arrow straight, and is narrow, being only about 350 feet wide. The passage was easy as we stayed behind three other sailboats and eventually passed two of them about 3 hours into the trip. 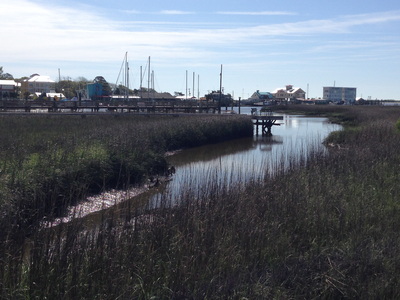 The canal is the longest on this part of the ICW, has minimal tidal change and therefore little current. The shoreline is stumps and shoals quickly and the canal is uniformly about 13 feet deep. The landscape is a mature pine forest that was clear cut on the private land and preserved on the national wildlife refuge. The only significant elevation is the 65-foot high highway bridges. There were a few scattered docks and even fewer houses. Cell phone coverage was very weak for most of the day. Three hours later, Andiamo entered the Alligator River that is two miles wide and ends about 20 miles later at the Albemarle Sound. At this junction, we filled up with diesel, snaked through the channel markers to avoid the shoals and ignored the charts that were now out of date. The Albemarle Sound has a reputation for being “lumpy” and at the worst, just plain treacherous. We stayed in Beaufort for extra days not because of the rain, or the moderate wind, but because the 7-8 waves in this sound. Today, it was flat and calm. 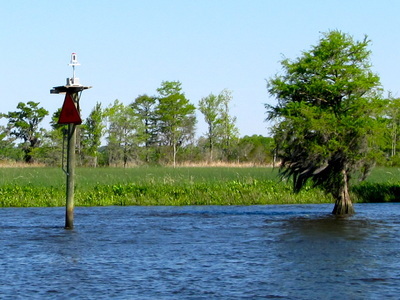 The entrance to the Pasquotank River was the destination and it was 22 miles away. 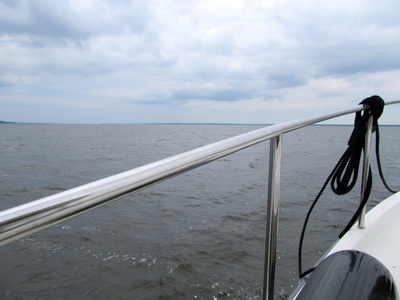 The Albemarle Sound is 60 miles long and is separated from the Atlantic by a thin ribbon of sand called the outer banks. Mid-afternoon with 35 miles to go to our destination, Elizabeth City, Andiamo was powered up and we slid across the sound. Then, we were pushed along with a fresh breeze, past a blimp hangar, the largest Coast Guard Air Station and arrived in Elizabeth City 9 hours after leaving the anchorage. 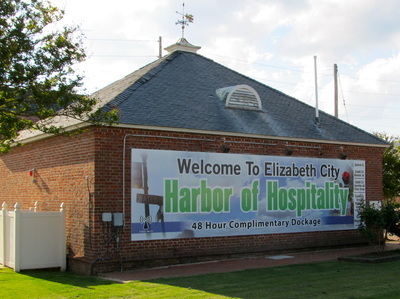 Elizabeth City works at making their town welcoming to boaters with 14 free docks that are located in the heart of the city. As we approached Marina Wharf, other boaters came to our help as Andiamo was backed into the Florida-style 15 foot wide slip that was a short fixed dock with pilings that needed be lassoed. Immediately, we were warmly greeted by the other boaters, peppered with questions about the tug and spent the following 90 minutes meeting and greeting. Caroline and Harry from the Ranger 31 Pourhouse were there as about 4 boats we had seen at various stops along the way. 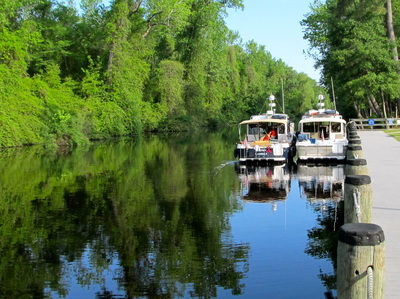 Most of the boats are leaving for the Dismal Swamp before breakfast to catch the first schedule bridge and lock openings. 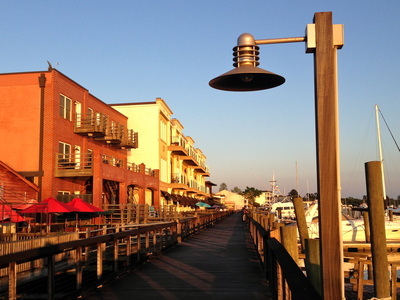 A light dinner was enjoyed and we were entertained by the wedding and high school prom with the age-appropriate music that drifted across the wharf. 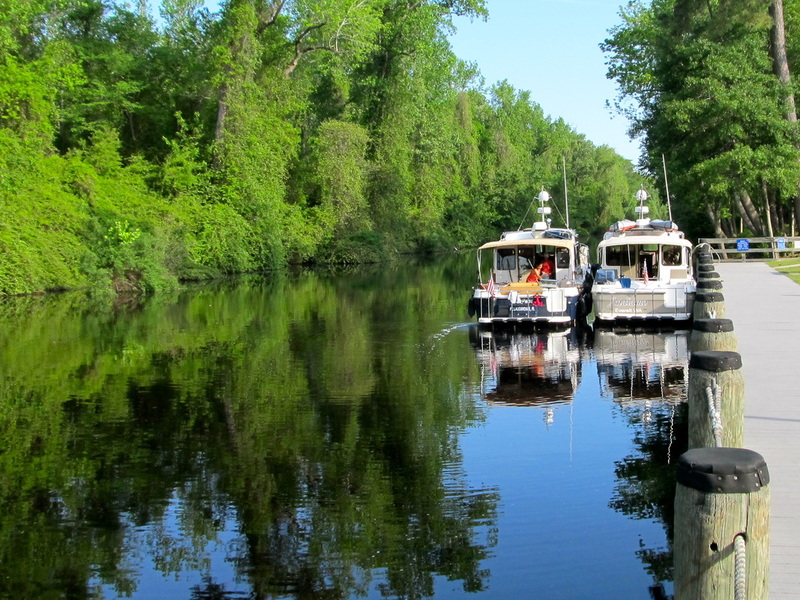 By 0730 hours, nearly the entire group of boats had left, as they wanted to make the 11AM lock and bridge opening at the southern end of the Dismal Swamp National Wildlife Refuge and the Dismal Swamp State Park. The two locks and bridges in the Dismal Swamp open on a set schedule. We planned for the 1PM bridge and lock opening so the few blocks around the marina was explored on this very quiet Sunday morning. 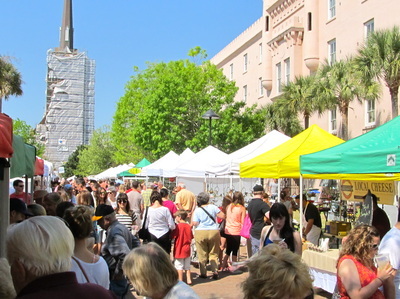 All the businesses were closed and the streets were quiet except for the Episcopal Church where the morning service had just ended. 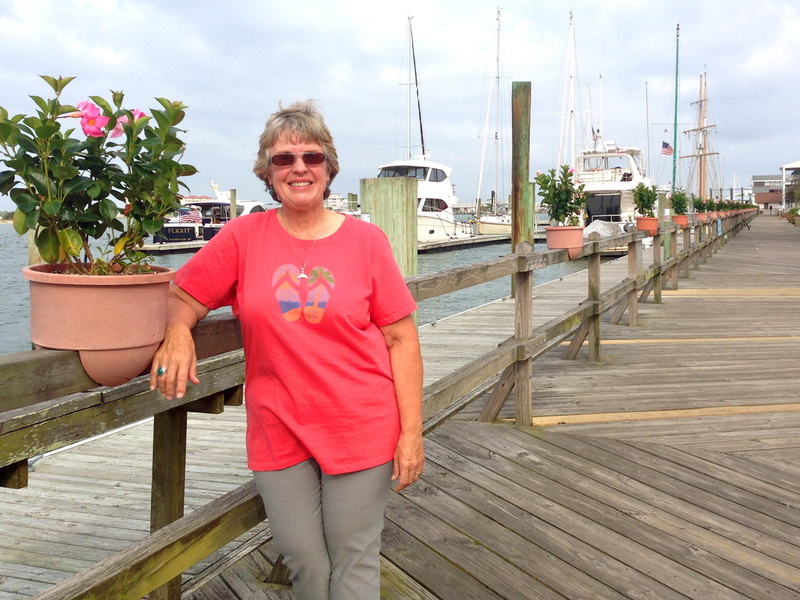 At the Marina Wharf, the day’s volunteer host arrived and greeted the remaining boaters. Just after 9AM, Andiamo pulled away, went through the bridge opening and headed up the Pasquotank River. 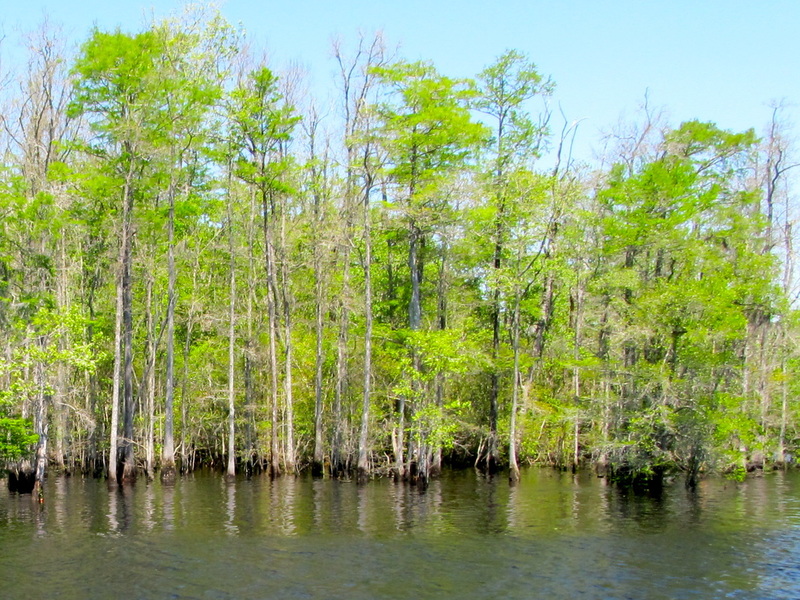 The colonists named the Dismal Swamp as every swamp was considered to be dismal. 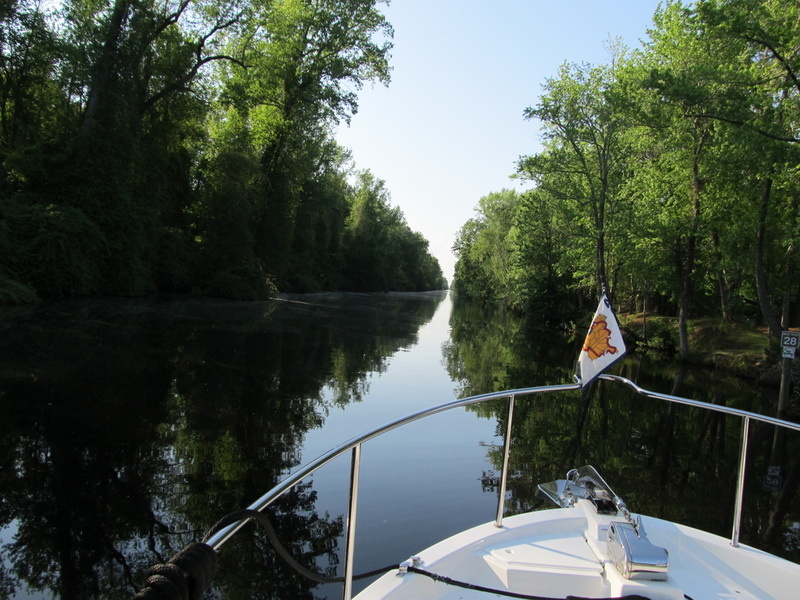 The waterway is a partially a canal that joins the Pasquotank and the Elizabeth Rivers and was surveyed by George Washington as an inland water option to going offshore. The 150 foot wide and 29 mile long canal was built in the early 1800’s, not by the federal government but by landowners who rented out their slaves for the hand digging. Untold slaves died in the work and the living conditions in the camps were outrageous. The canal had the immediate impact of creating a transportation corridor where barges were pulled by animals on the shore that joined the economies of the Chesapeake to those in North Carolina. The canal started the effort of draining the swamp that would eventually shrink it by 2/3 in two hundred years. 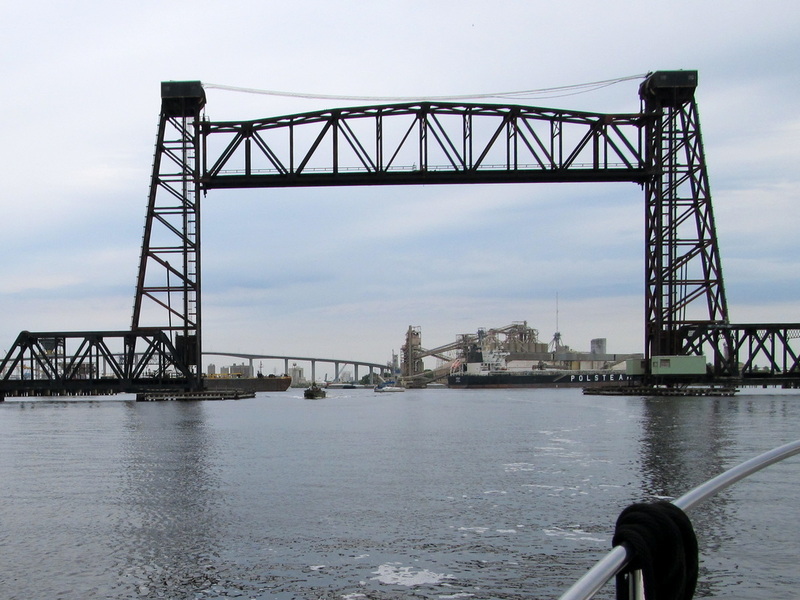 The canal was nearly abandoned 50 years after it was built when a larger cut was made to the west. Today, the Dismal Swamp is used by recreational boaters who have the time and the desire to experience travel, as it was 200 hundred years ago: slow, deliberate and scenic. 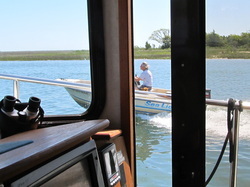 Once inside the wildlife refuge and the state park, the speed limit is “No Wake.” The narrow channel makes the effective speed about 5MPH. 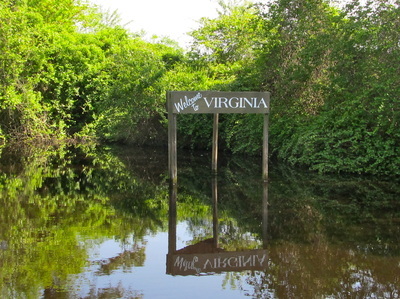 Faster boats, ones with deep drafts or are very tall or very wide use the Virginia Cut, also known on the charts as ICW Route 1 where the 58 total miles is often done in one day. 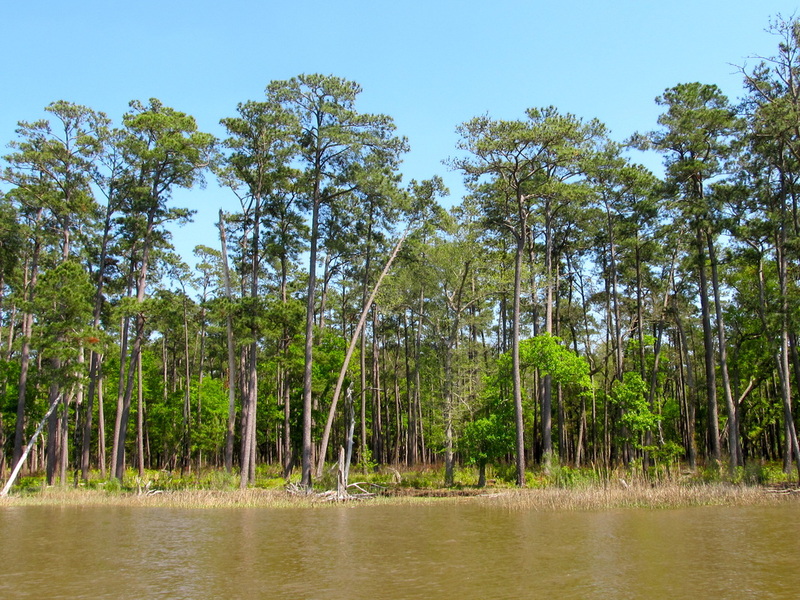 Leaving Elizabeth City, nearly all the trappings of human habitation had melted away to thick groves of trees and understory. 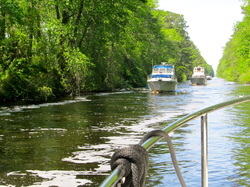 The river turned back and forth but the boating was easy as the distance between the shores was 300 plus feet. Another Ranger Tug was headed south a brief conversation occurred over the radio. Andiamo may see We Tug in the Great Lakes. At the head of the river, the waterway abruptly narrowed and with a slight turn, Andiamo slipped into the canal. In the distance one sailboat was ahead of us. Part of the canal is immediately next to a highway, part shares a property line with houses, and part shares a common border with a walking and riding path. At the south lock, we arrived 45 minutes before the scheduled opening, so the tug was moored to the pilings outside of the lock. 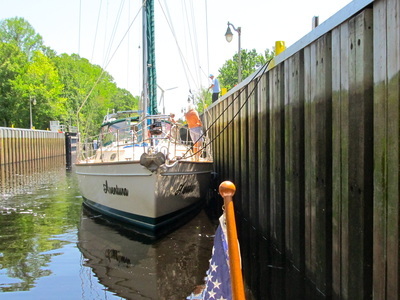 Two more sailboats would arrive and joined us in the lock when it was opened. 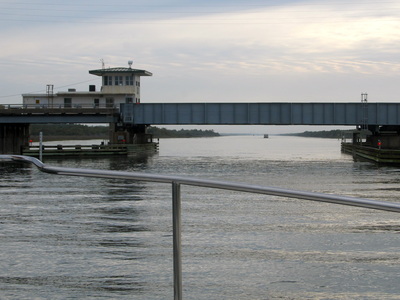 The lock operator became the bridge tender after releasing the boats from the lock. He drove the mile to the bridge, put down the gates on the highway and raised the bridge for us. 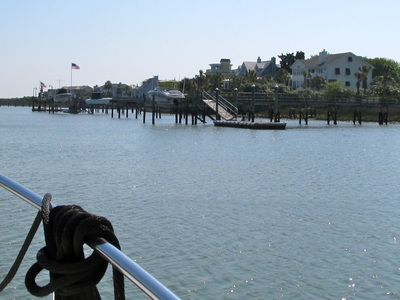 We would continue 10 more miles, watching for snags, and stop at the dock at the state park welcome center and museum where Andiamo would raft to the other boats there. 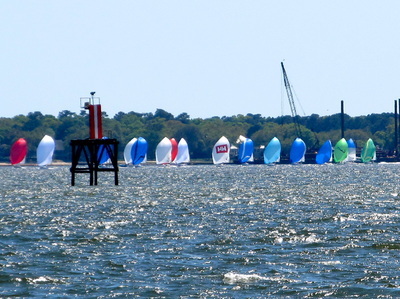 The sailboats continued on north. Seven boats, rafted three deep would spend the night in this quiet place. This welcome center also serves a rest area on Highway 17. On one had, we were in a pristine and quiet sanctuary and yet the boats were moored at the edge of a highway’s rest area where dogs were walked and travelers stretched their legs. 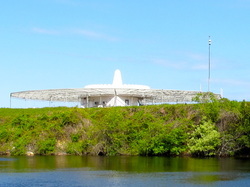 The museum is across a footbridge that is opened by a park employee when the boats come and it tells the natural history and some of the human history. The period of the civil war and after was a glaring absence. Perhaps, the committee that approved of the museum’s message just could not agree? 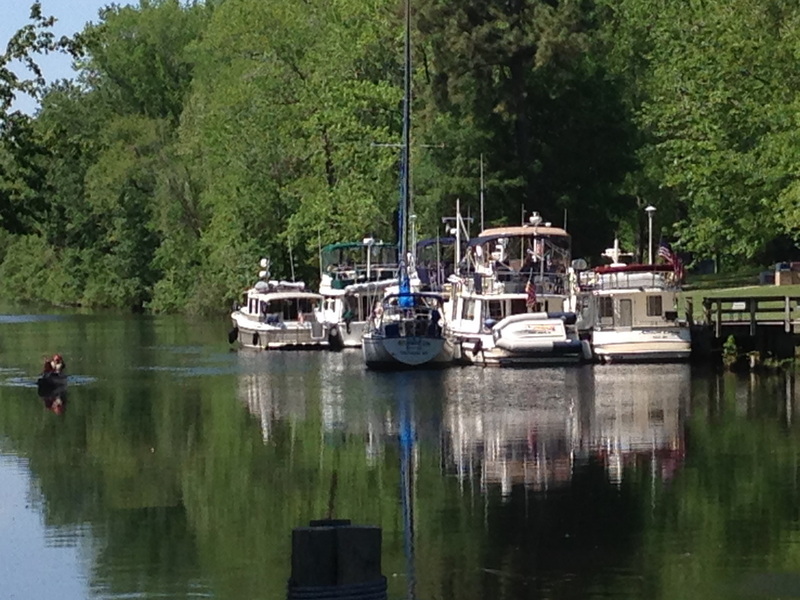 Nearly all the boats on this dock were Loopers and we enjoyed a great conversation and story telling. The odd part was that none of them were veterans of the east coast so there were no masters to learn from or get ideas on what to see and where to go. We enjoyed Caroline, Harry and Jiew, who was visiting from Thailand. We had a serendipity moment with John and Sue of Thanks Dad when John revealed that he, too, had retired as a Police Chief. The next day, we woke to the sound of the generators from a few of the rafted boats as they were preparing to leave. Harry called and said his engine battery was dead and the generator would not start. For the next two hours, various strategies were tried and there was ample assistance from the captains of the boats. 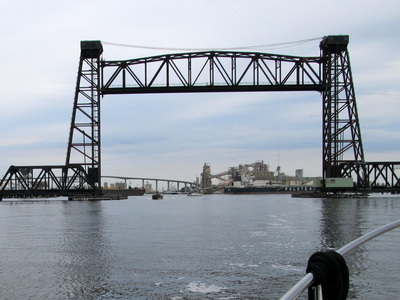 With the time approaching to meet the bridge and lock opening that was 17 miles away, Pour House was floated over to raft with Andiamo and the other boats took off. The battery issue was resolved when the other battery banks were paralleled and enough time went by to charge up the engine battery. 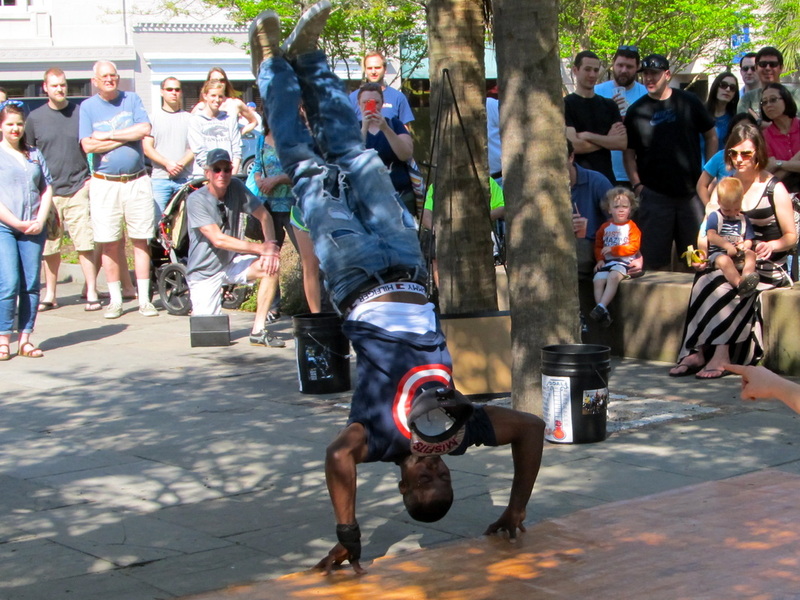 When Pour House’s diesel roared to life, there were high-fives all around. 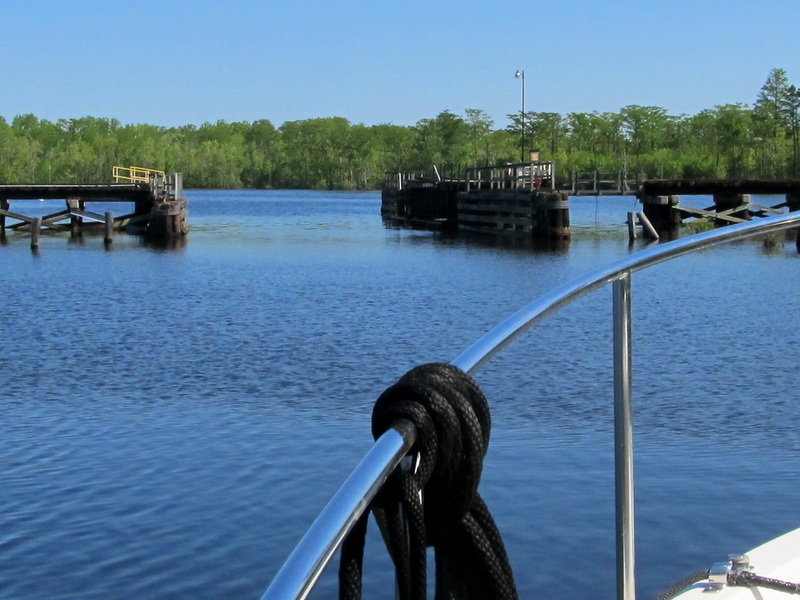 Then, we left together to navigate the 17 miles of 100 feet wide channel that was arrow straight ended at the bridge and lock at the north end of the canal. 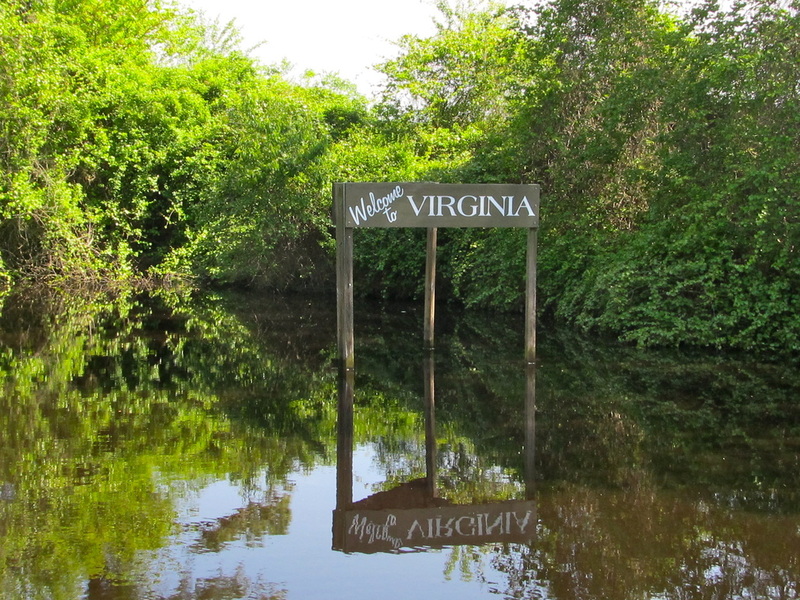 On the way, Andiamo crossed into Virginia. A few short miles later, Andiamo entered the busy harbor of Norfolk, Virginia, moved aside while huge barges came down the narrow shipping channel, was guided away from the mammoth Navy ships by security boats that were under repair, and past the marina with the Loopers were having their Spring Rendezvous. 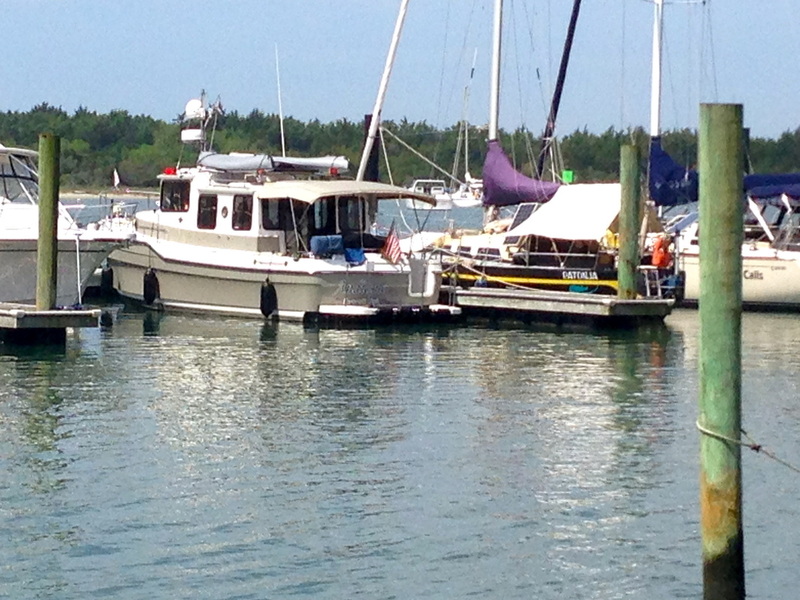 Andiamo’s destination was the quiet and out-of-way marina of Scott Creek Marina in Portsmouth. 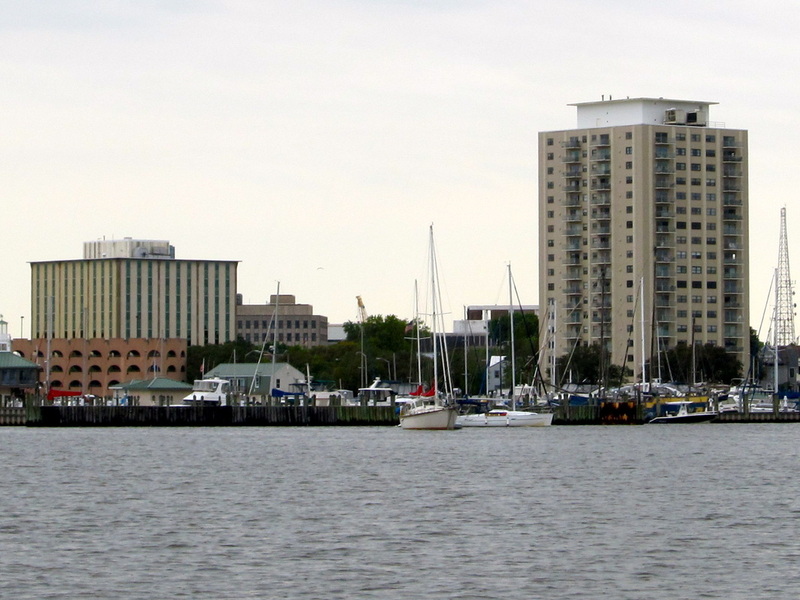 The Elizabeth River separates the cities of Norfolk and Portsmouth. The later is the stepchild to the former with a decaying downtown and very little vibrant activity. Bill is the manager of the Scott Creek Marina and he accurately predicted our arrival time at the fixed docks. The marina has more live-a-boards that some places because of the affordable annual moorage rates and it is surrounded by industrial activity of ship repair and associated businesses. Over the past two days, Andiamo had traveled 51 miles. Surprisingly, it was very quiet except for the occasional military aircraft activity. The evening was interrupted by a lightning storm with hail that lit up the night and made the inside of the tug sound like a snare drum. A sign that nobody can fully understand because there are too many words and it is too far away. Probably a committee that was led by an attorney made it happen. A simple message with powerful meanings. 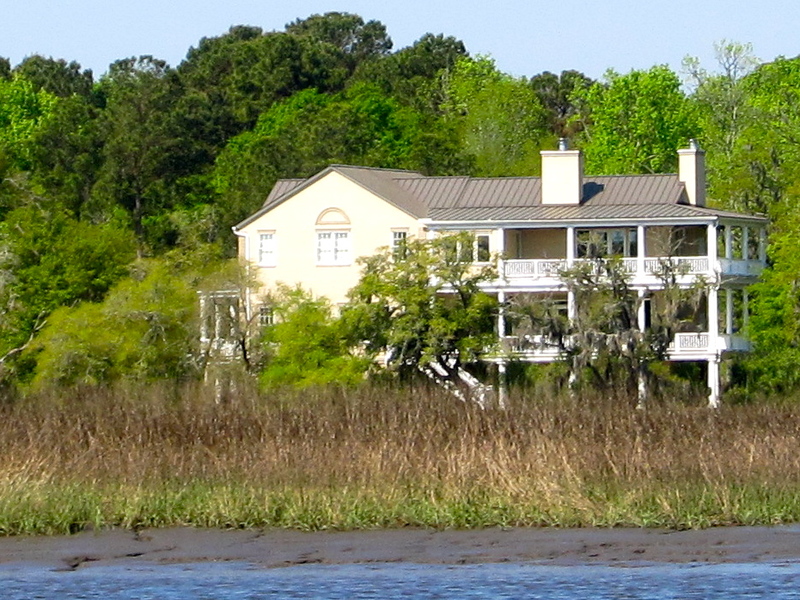 The ugliest building in Beaufort houses the visitor center. Though the inside makes a nice impression, what were they thinking when the color was selected? It is a great replica of "Baby Poop Yellow." 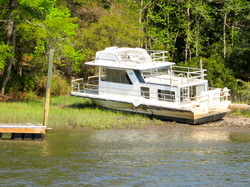 Affordable and long-term moorage on the river. 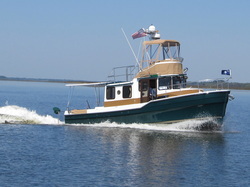 This Ranger 31 broke rule number one of the "Ranger Cult Family" of not being friendly when another Ranger Tug called on the radio. 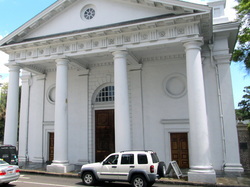 This is St. Michael's Church in Charleston, but to the casual visitor, the building is an unknown with no sign or outward message of what this is, and we were looking for it. Took two searches to determine what it was. Friendly? Welcoming? 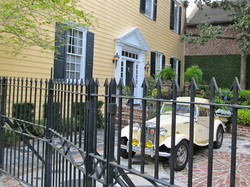 Did the car match the color of the house or did the house match the color of the car? Which came first? Or, maybe it was a package deal. 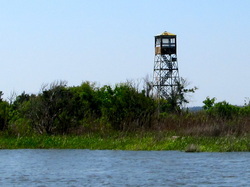 A fire lookout tower in the marsh land? Surrounded by water? It makes an excellent perch for the birds of prey. 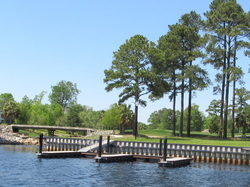 Docks and golf courses? Does the course offer a discount to boaters? Or maybe the golfers can take a break and drop a line the water betwen holes. This dock building business has literally gone under. 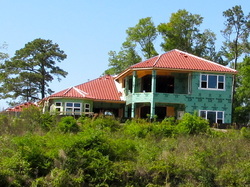 The construction industry has rebounded and homes are rising among the forest. Is this a "green" home? At the Myrtle Beach airport, looks like something that would guide in the alien spacecraft. 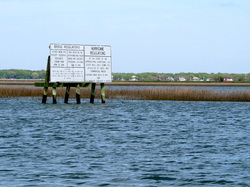 A North Carolina boat ramp. I thought the ramps built by the Canadians were tough. Notice it is an extension of the town's road? 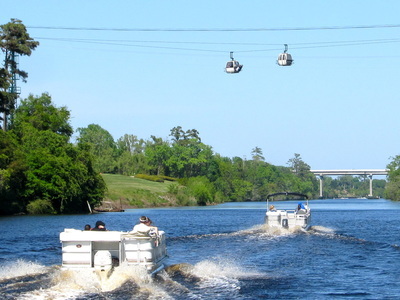 This boat brings a whole new meaning to the phrase, "hanging out to dry." 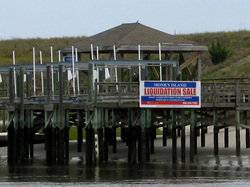 How is an island liquidated? This most be appealing to the right kind of buyer. 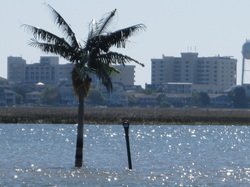 A palm tree in the water and in North Carolina? Yes, it is a fake yet it serves a distinctive landmark. This is the common distance local boaters use to pass. We called it "Beer passing distance" and is practiced often. After 100 passes at this distance and closer, you just shrug it off. Lifejackets? They left those at the same place where their common sense was. Look carefully at the left side of the boat and see the bird's nest. This is a new purpose for these derelict boats and they will probably receive some habitat protection. 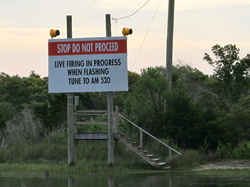 Just when you think you may have seen everything while boating, a safety sign while going through the Camp Lejuene Marine Corps Base. The ICW goes through the base and clearly they are in charge, well, as it should be. A serious wake is about to happen. He probably could not go any faster or be any closer.